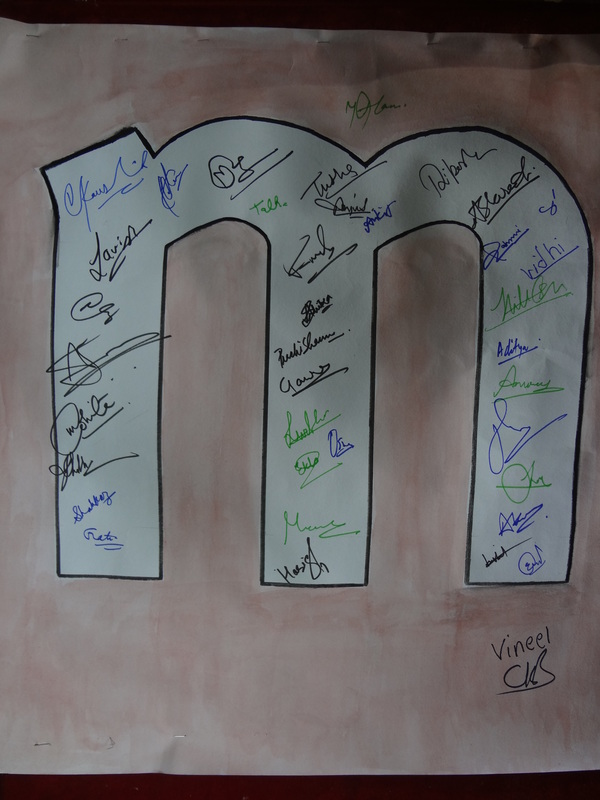 Varun Kaushik's Blog | Made in India, with Love! It’s all about using Code and doing great things that matter. 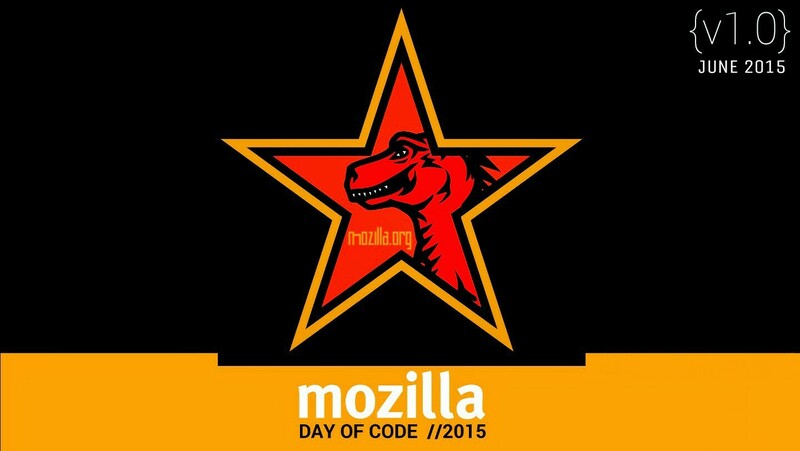 Mozilla Day of Code, is a Mozilla Community Rajasthan’s initiative event. 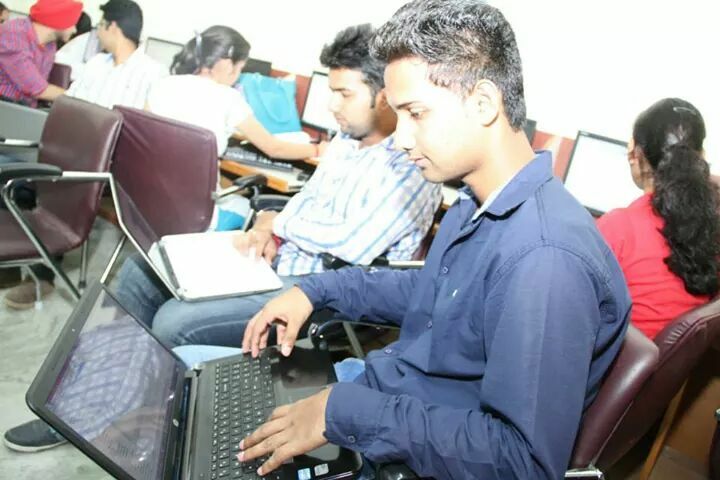 Which focused on building new and amazing apps and services and improving the existing one. 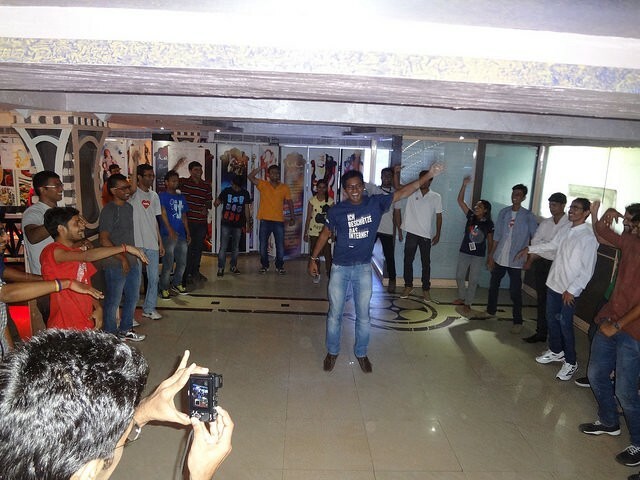 We all gathered together at June 13, 2015 at the venue together to make it a productive Saturday and take the best out of the event. 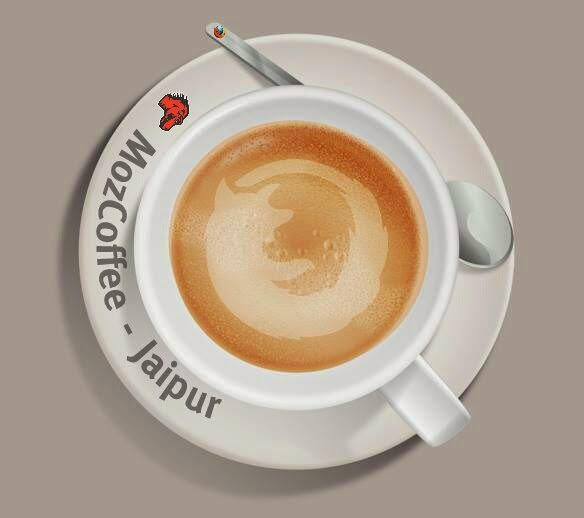 The day started with a MozCoffee with all the club leads and the core volunteers and Reps to discuss about the new SIG’s by Mozilla Community Rajasthan and to discuss and plan for the upcoming Maker Party season and our plans and events for this year. 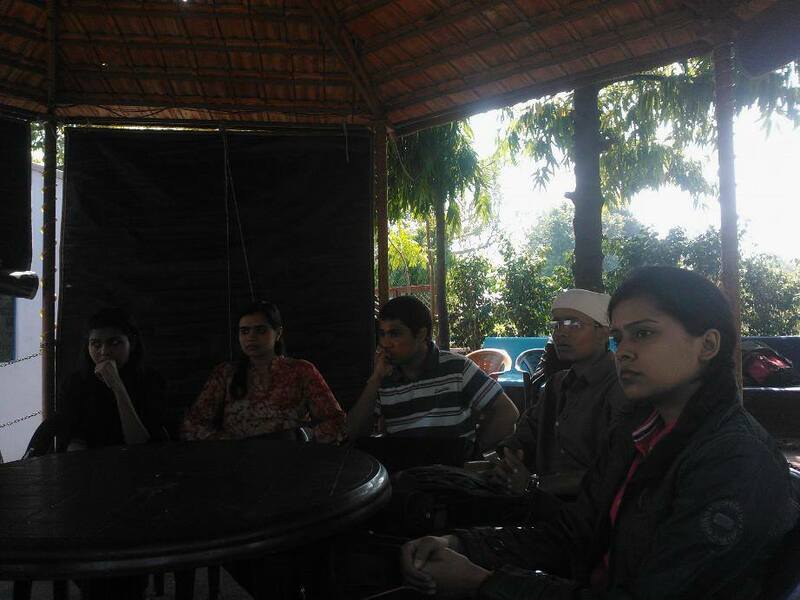 We carried on the productive coffee session for around 2 hours, before kicking off MDoC and the star of the event. 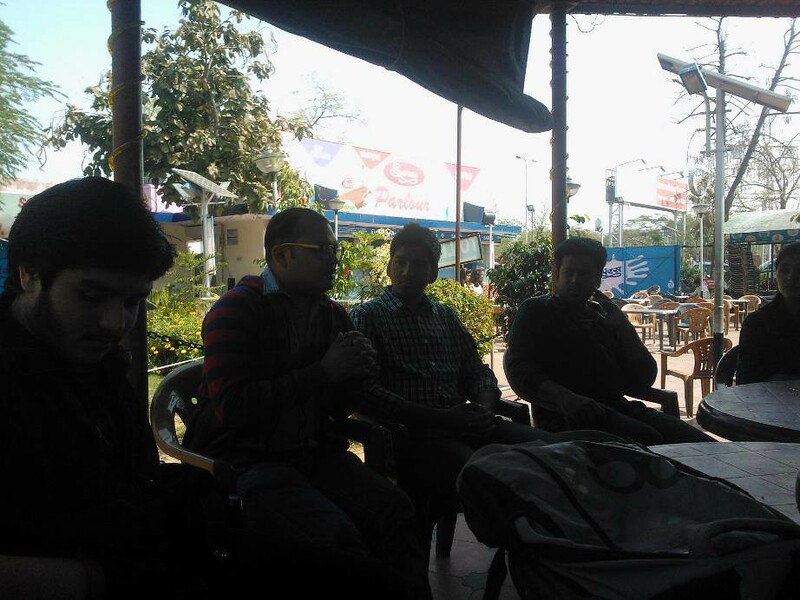 After the successfully MozCoffee session, we started on with our very amazing MDoC. 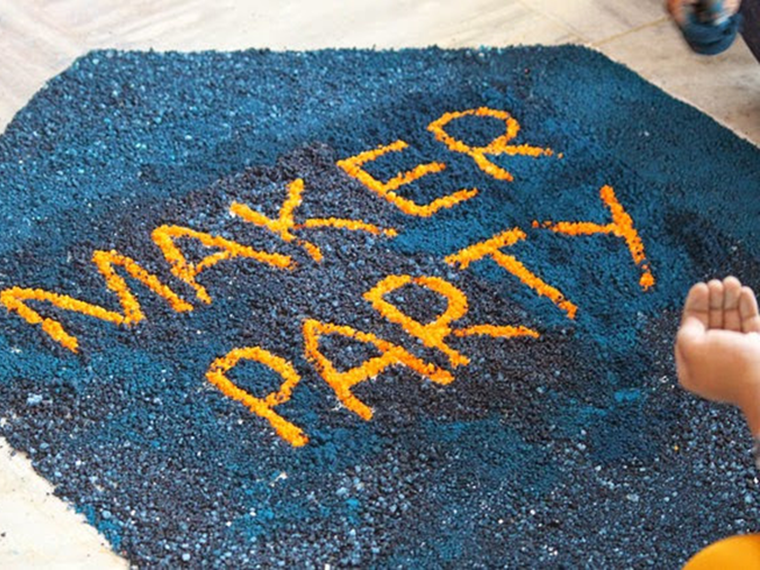 It started with a bang with small different groups focusing on making and building great new things and improving the current things. 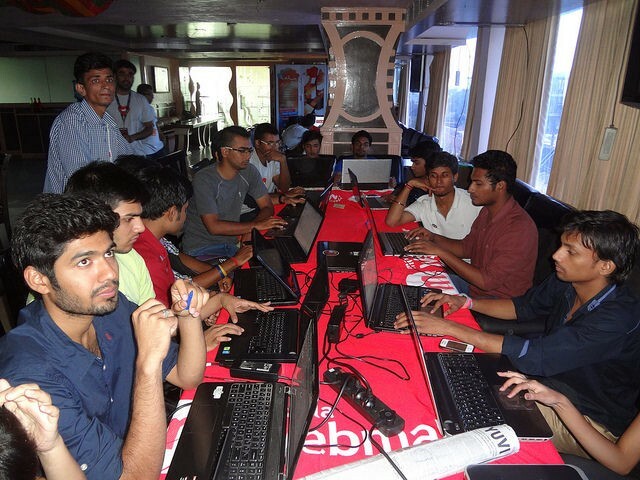 There was Codebase, AppDev, Webmaker, Appmaker and it all was productive. Amazing. It was all great. We setup a big bar and we were successfully able to achieve it. 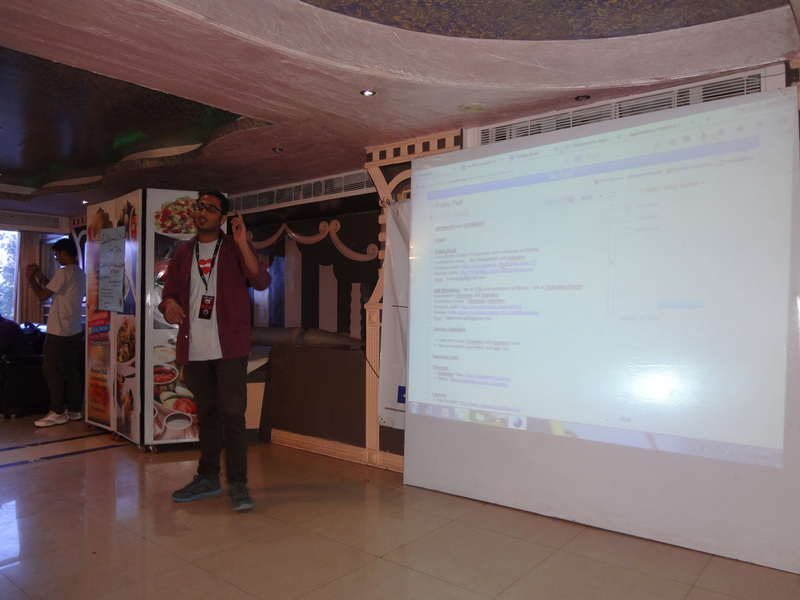 The team gave many code patches, built 3 amazing apps for the productivity section on the marketplace, filed and helped in solving many Bugs and yeah, did a lot of fun and learnt many things. 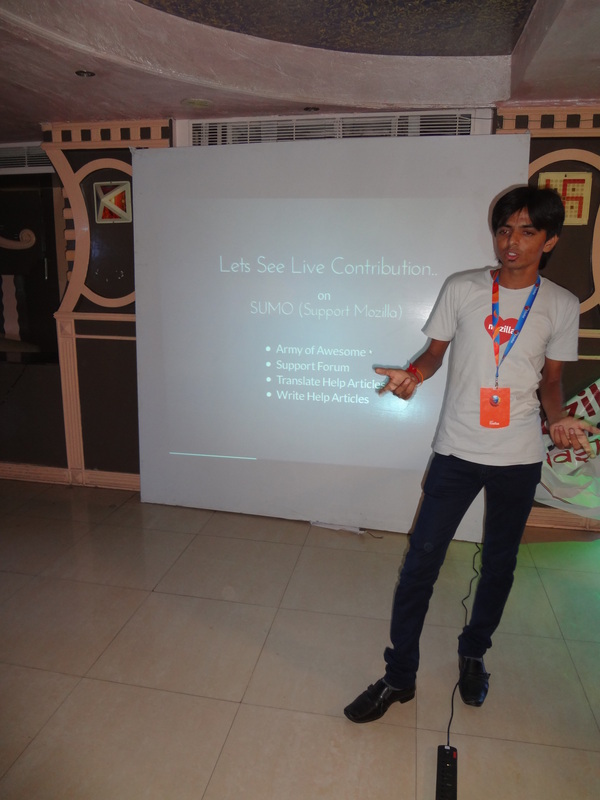 You can see our photo gallery on the Mozilla Rajasthan’s Flickr stream and the metrics on the Reps page of the event. It’s all about code and building great new things. 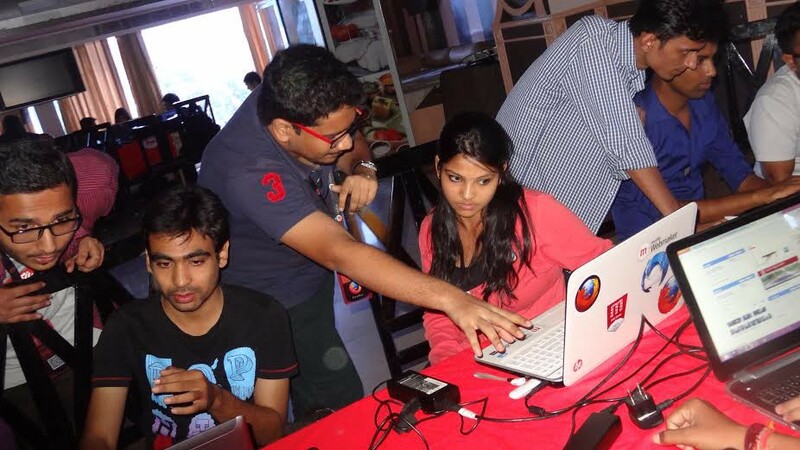 Mozilla Community Rajasthan is very excited to announce the Mozilla Day of Code | Build-a-thon (v1.0). 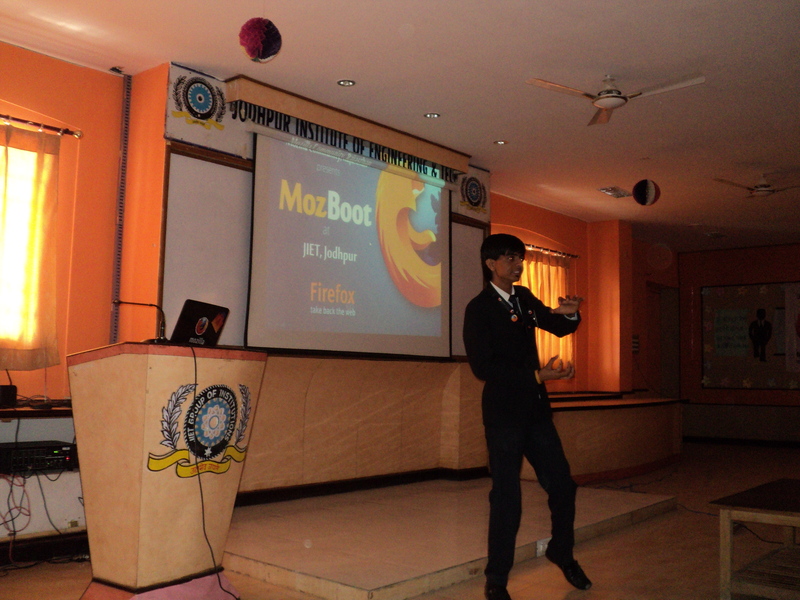 Mozilla Day of Code (MDoC) is an initiative taken by Mozilla Community Rajasthan and is a monthly program which primarily focuses on Innovation, building cool new products and services and making the current Mozilla products and services more better. We all are looking forward to seeing you at the first MDoC. 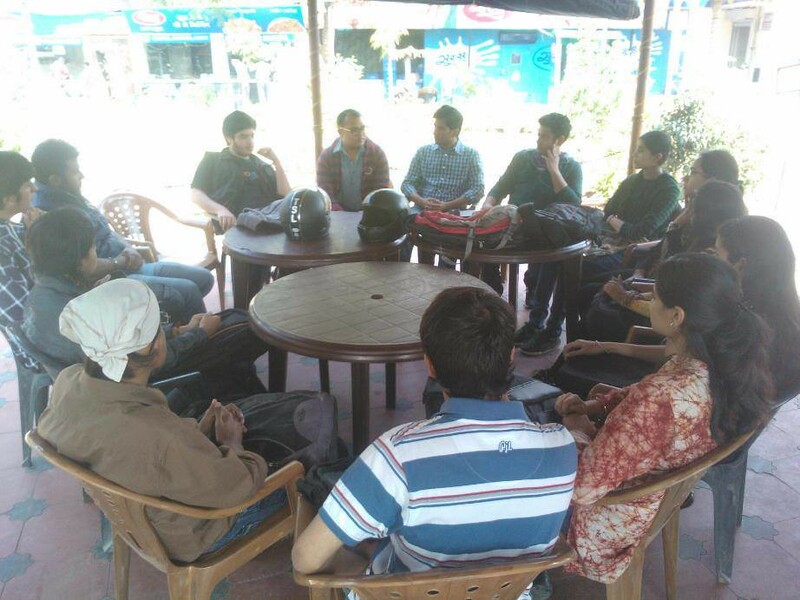 After some amazing events and workshops we finally decided to do something great at the newly formed Mozilla Community Punjab. 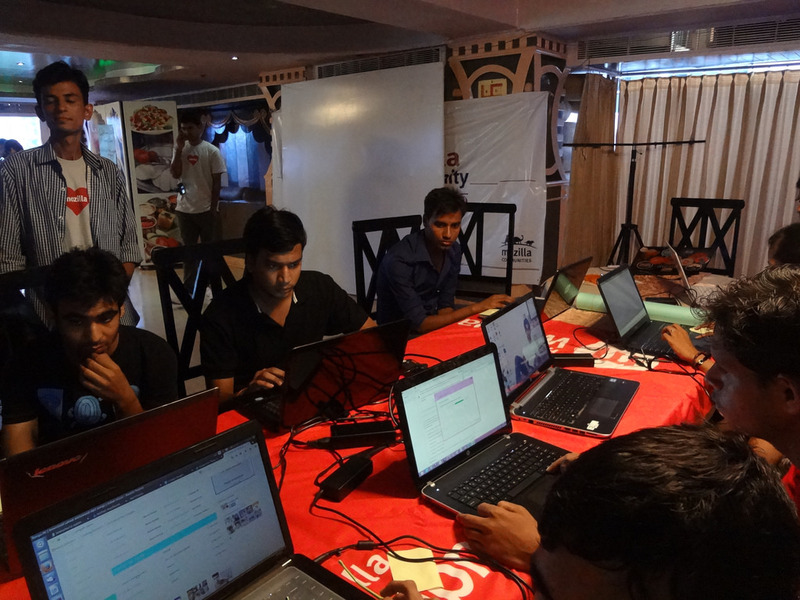 We stuck to our motive: Quality and Productivity and organized a great event. 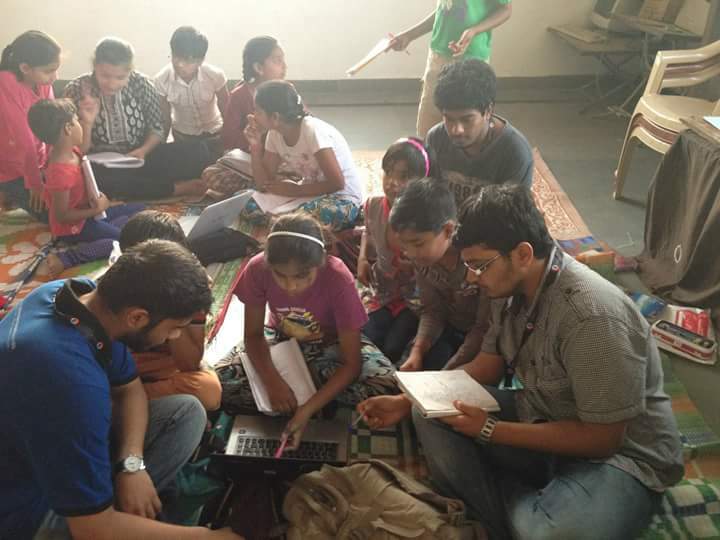 We followed the amazing initiative ‘Kidzilla’ and decided to teach the kids about web, using computer, basic HTML and about open source. 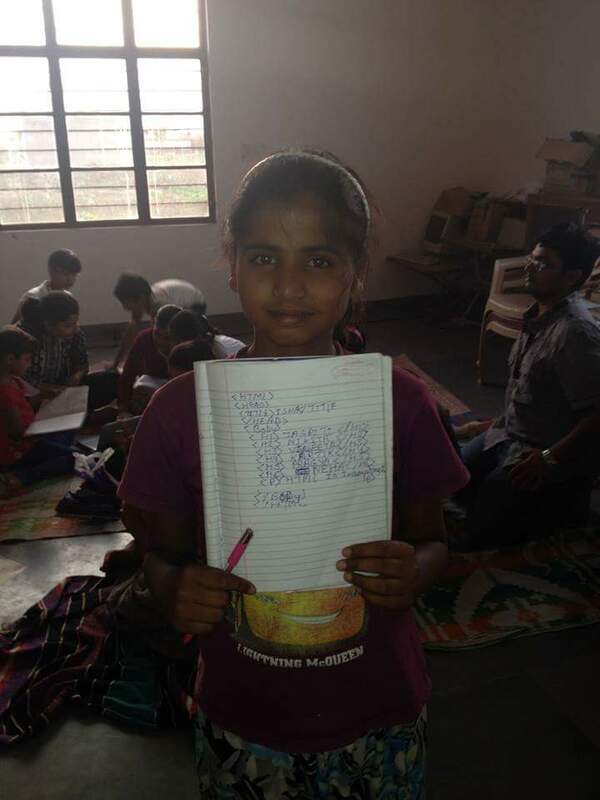 We went to a nearby orphanage and school for the same. We made all the kids comfortable and showed them some cool things and gave our laptops to them to explore things and the web. 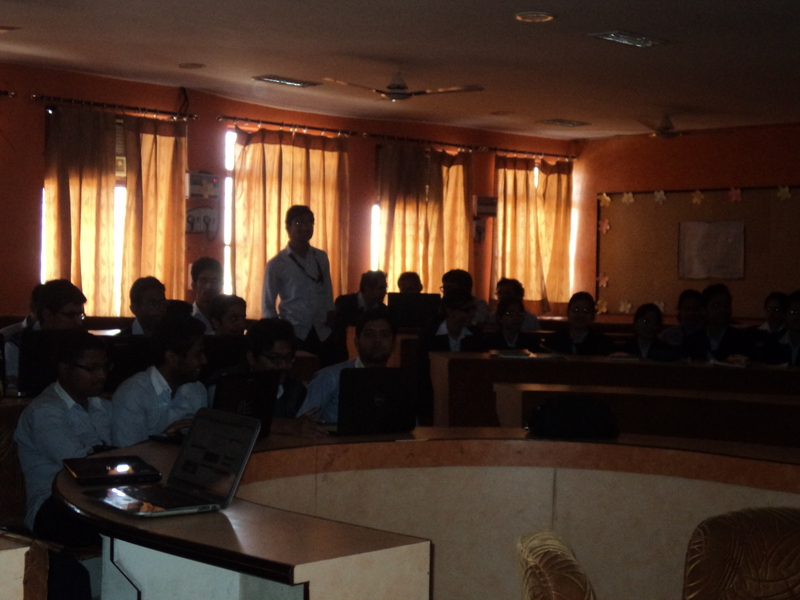 We taught them about The web, browsers and about what open source is. 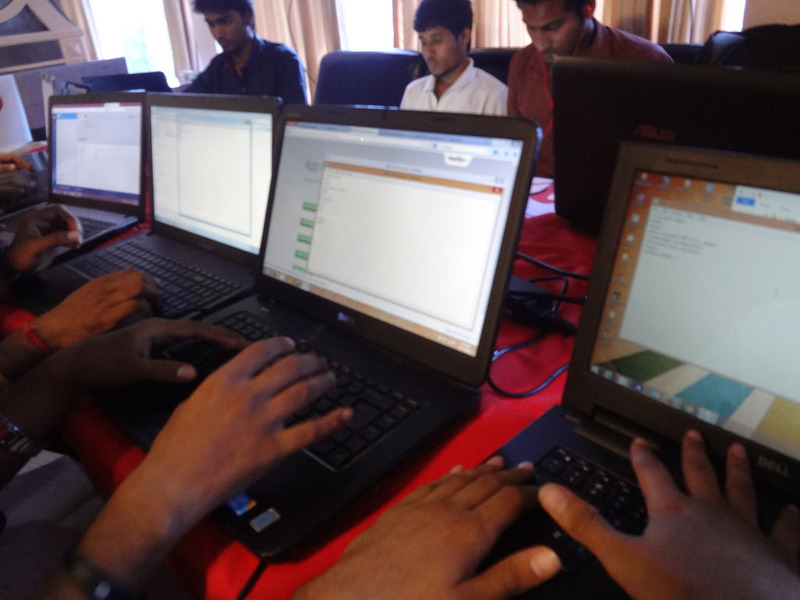 We also gave them a very easy HTML lesson and they found that pretty interested and even made some programs. 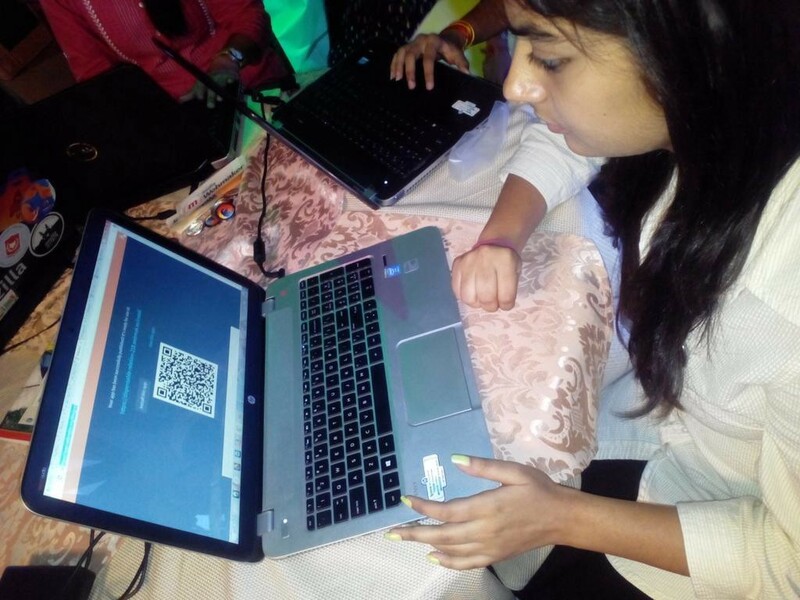 We were amazed to see the young minds doing such amazing things. And they day 1 was well spent with the kids. 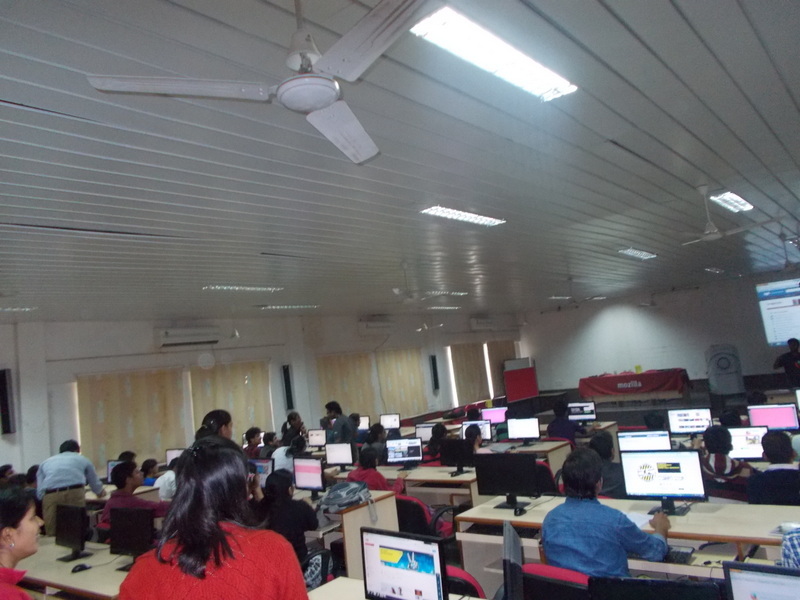 Literary talks, friendly web and HTML lessons, fun-learning activities and all good things. 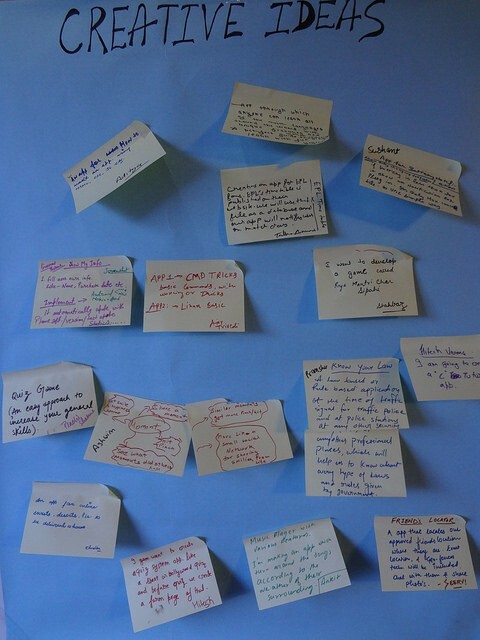 We had a great agenda for the day 2. 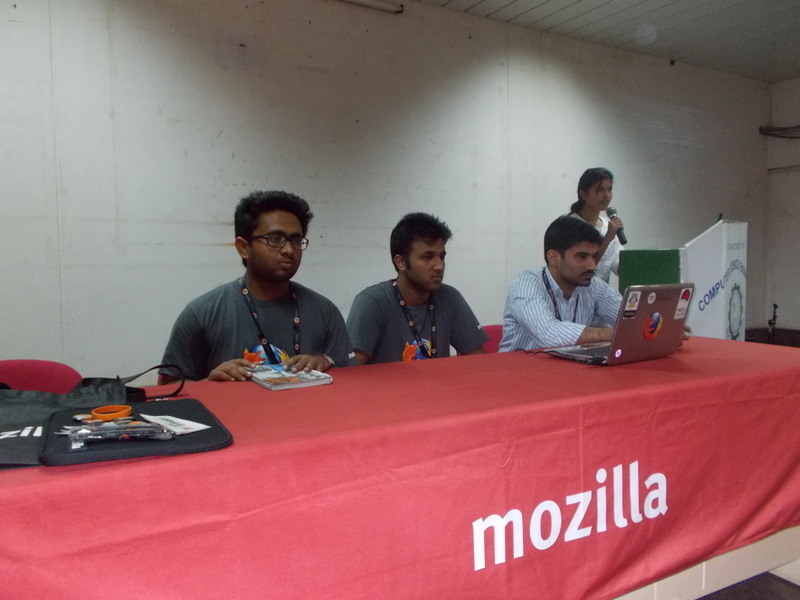 The main motive for us was to successfully complete the matrices, make a long-term impact, teach quality things to the attendees and spread the word : Mozilla. 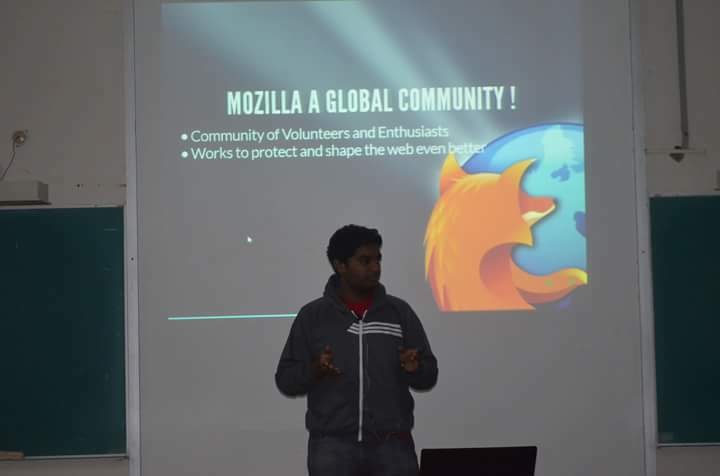 The day started with some basic introduction about FOSS, about Mozilla, the role of Mozilla, becoming a part of the Mozilla family, Mozilla’s products and services and all other great things. 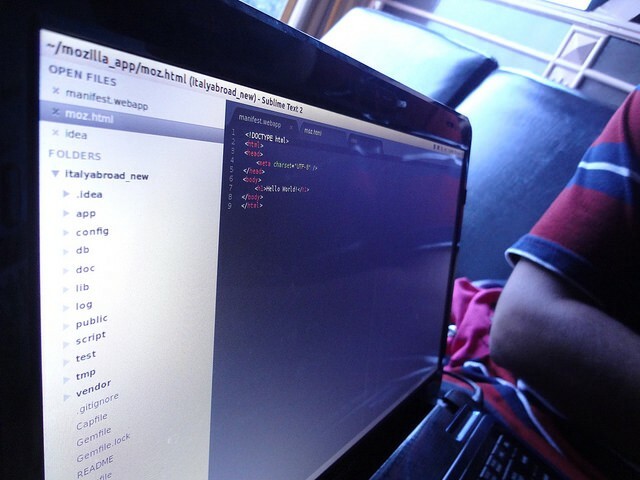 Programmers were taught about codebase, Gaia, Firefox OS app development, solving bugs (Bugzilla), patches for Firefox OS and hands-on to many amazing things. 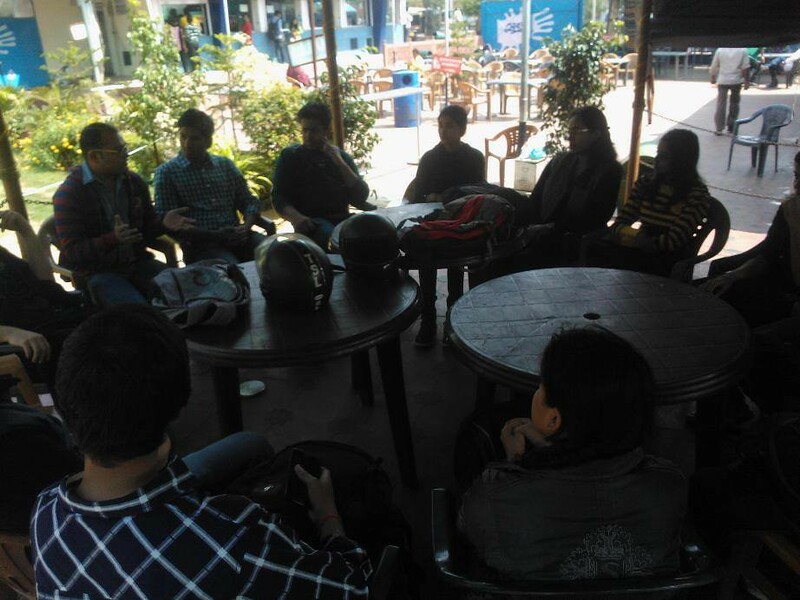 The non-progammers were given introduction about SUMO, localization, Webmaker, Events etc. 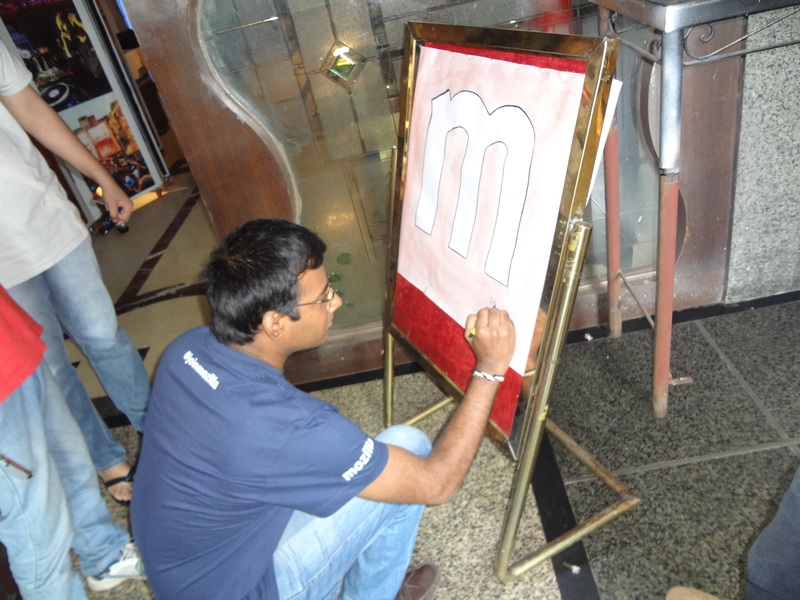 They were then divided accordingly and hands-on sessions on different areas were done. 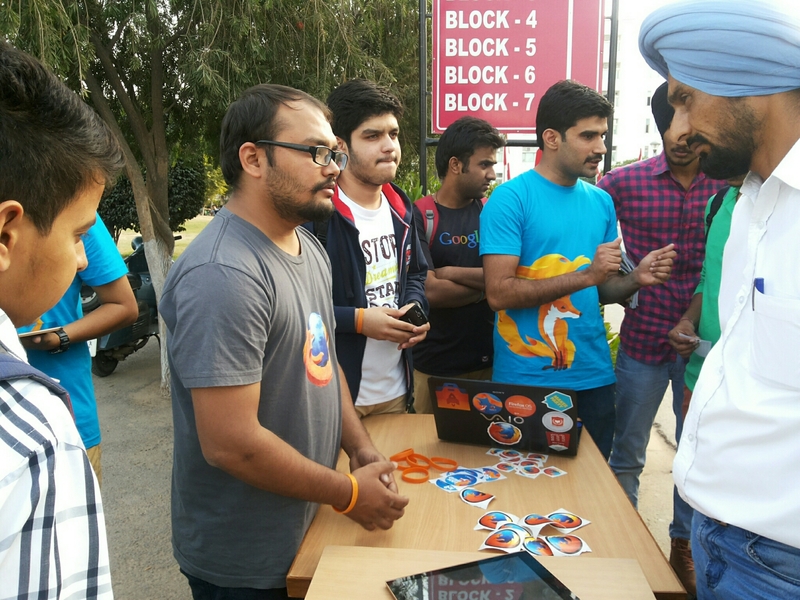 We also set-up 2 booths outside the entry gate and displayed Firefox OS devices and swags for the people. 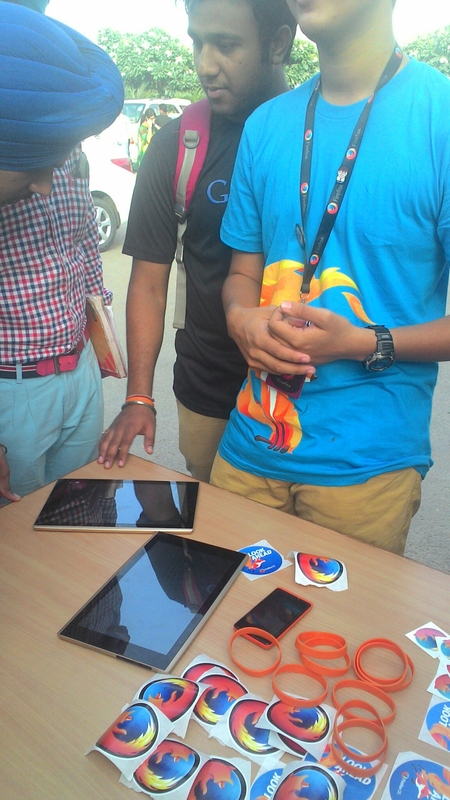 We showed them the future OS and how can people be involved and be a part to the revolution. The loved it and explored the same. 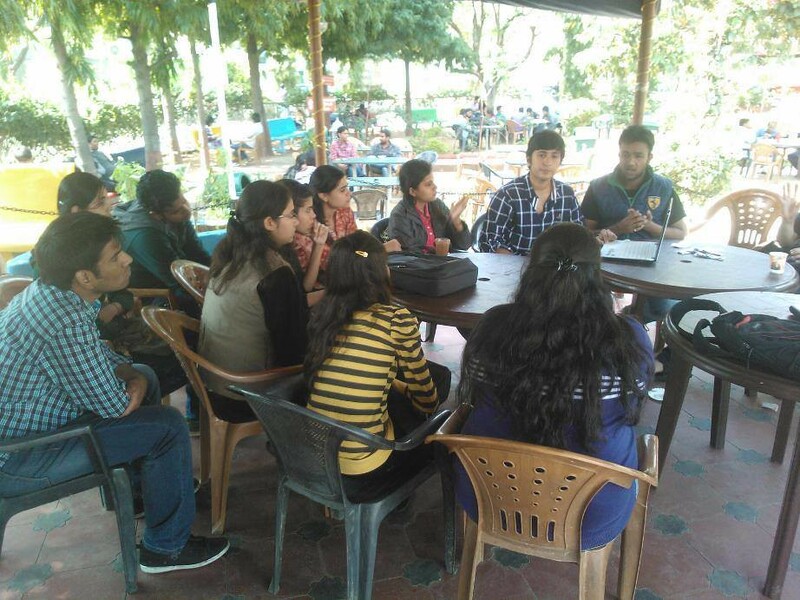 *We covered all our matrices, made a great impact and attracted many amazing people who wanted to be a part, host their own events and contribute. 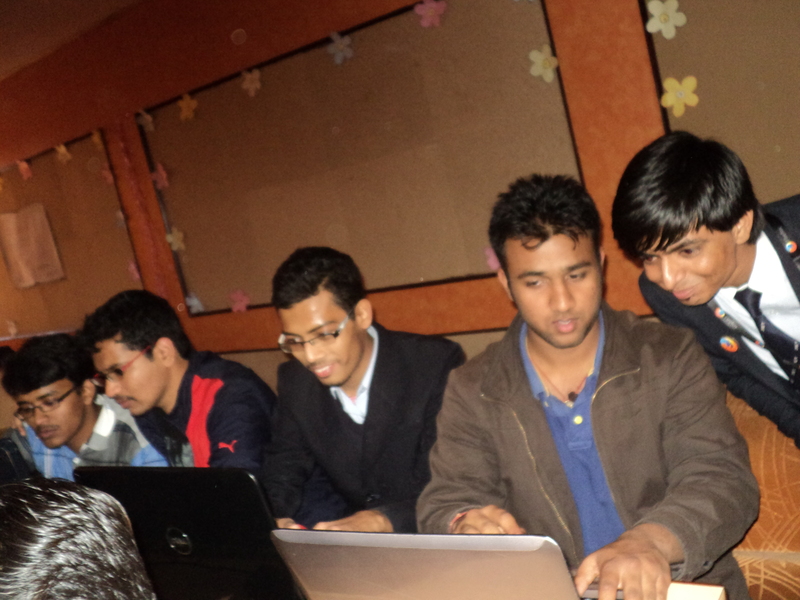 It was one of the most productive event of all time. It was all about Quality and great contributors. Doing food is part of our code. 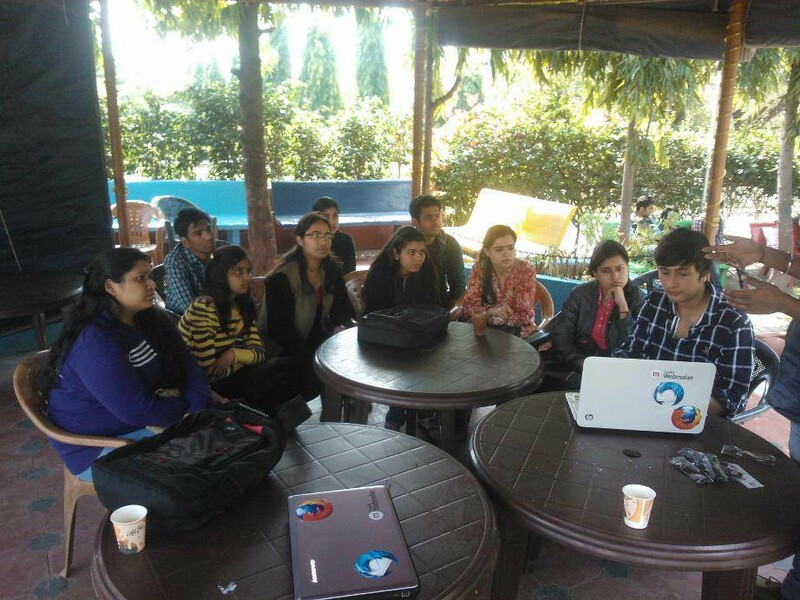 Mozilla Community Rajasthan organized a grand Mini-Camp in several universities in Punjab. The plan was to organize it in a single university in Punjab, but the very poor response by the FSA’s of the university which we planned as our Venue for the event made us change our plan. 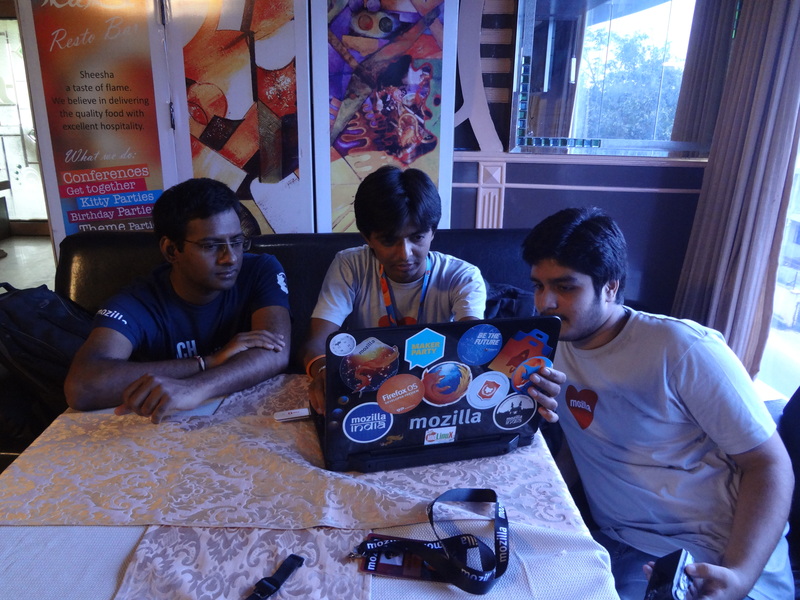 *Hands-On session Firefox OS App development. 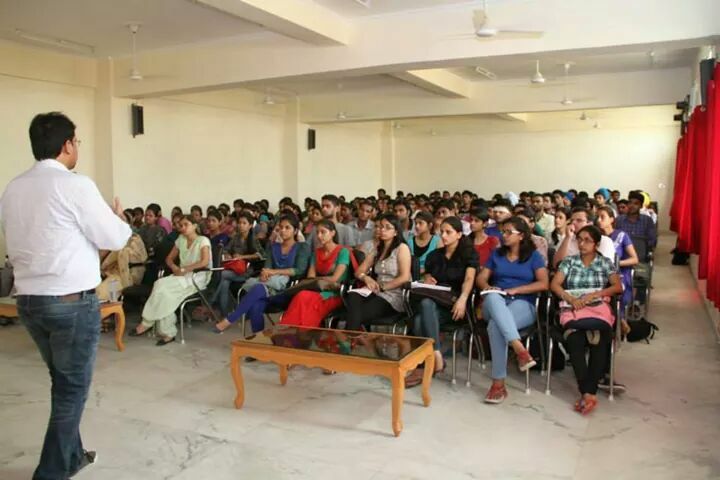 We received a phenomenal response from the college and the outstanding keen-to-learn students. 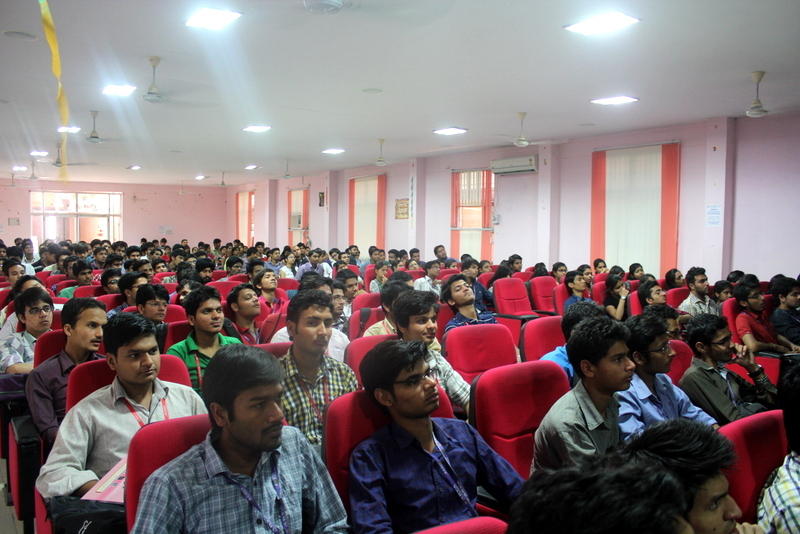 Almost 220 students attended the talks and the Hands-On session. 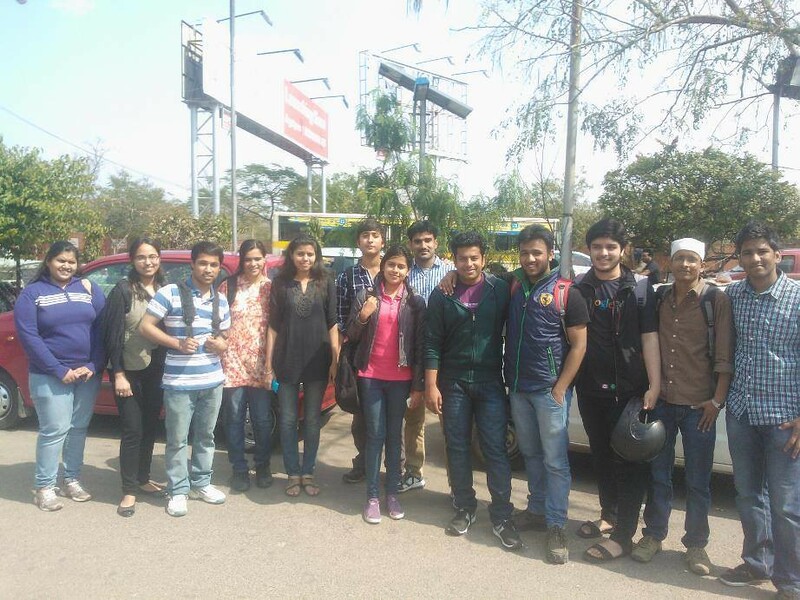 After the amazing session at Rayat Bhara University, we had a quick breakfast and then rushed to our second venue: Chandigarh Group of Colleges. We got an overwhelming response from this college chain. 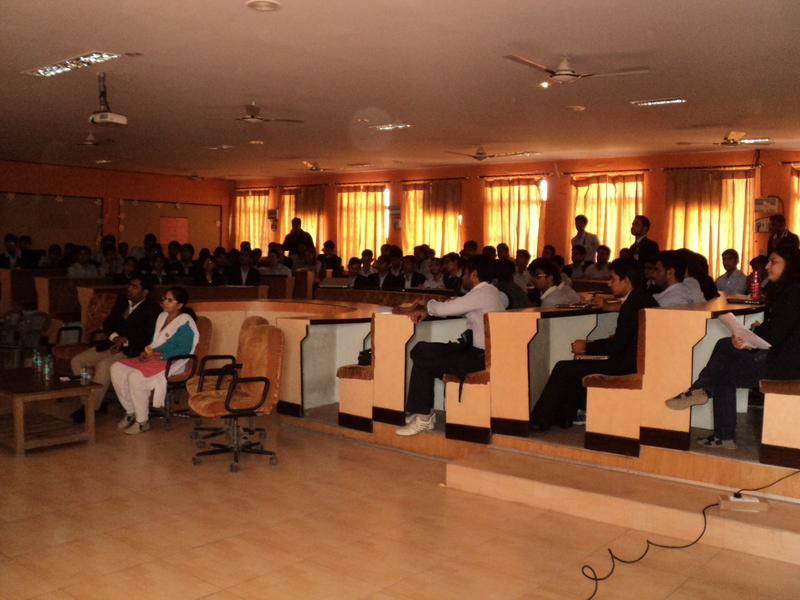 Not only the students, but the teachers came out in a good number to attend the fun-learning sessions. 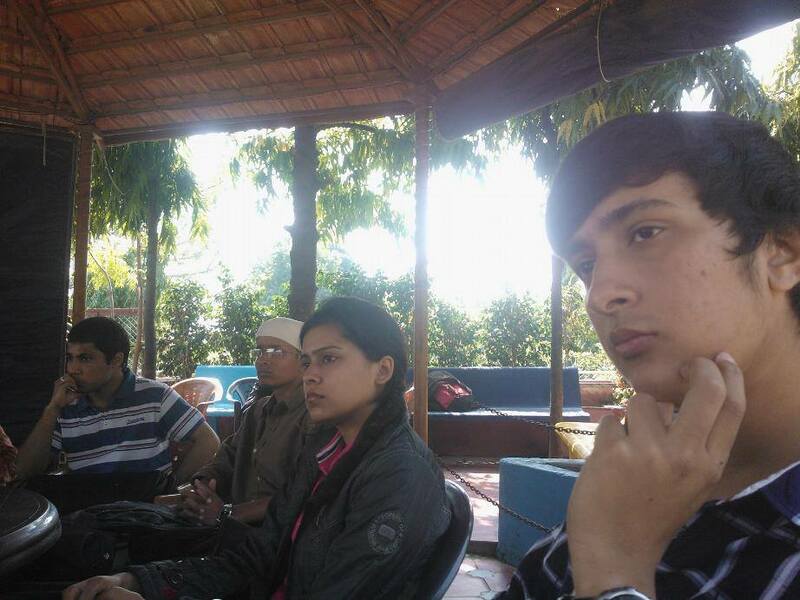 Each one of us gave a fun-learning talk/Hands-On and ended up the round with a QA session. 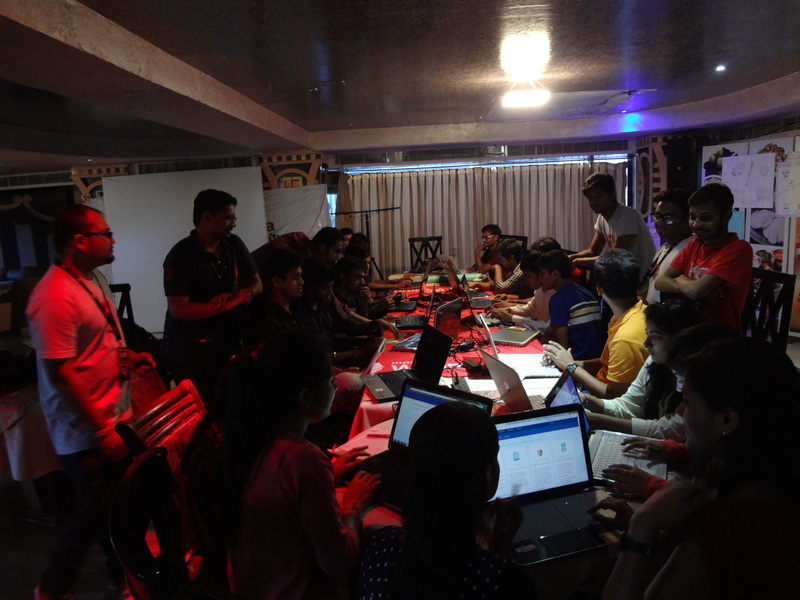 The attendees here were not from a technical background, so we decided to go with a Webmaker Hands-On session and teach them. 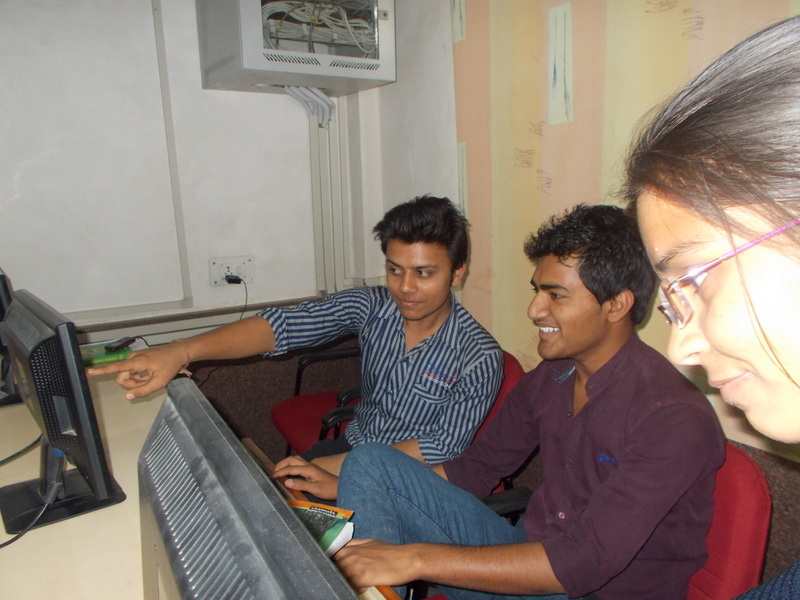 They were very excited to know how to create cool apps without any code. 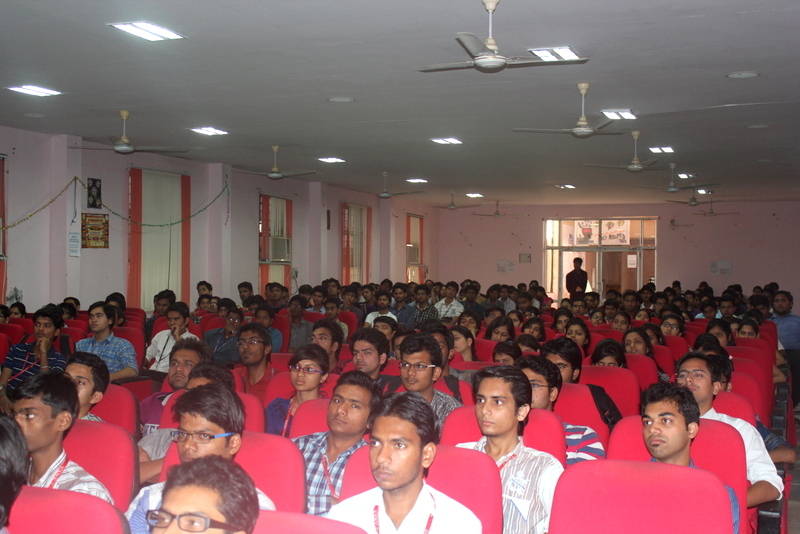 More than 200 students became a part of it. We decided to do something different here. 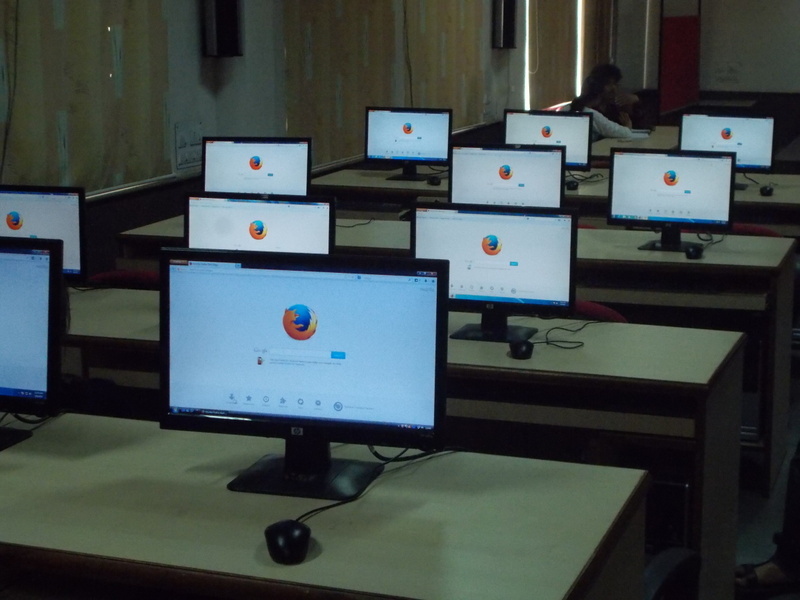 We took permission from the college authorities to set-up a small stalls in the college premises and we displayed Firefox OS devices at one, Knowledge and Learning at another and FSA and Registration at another, to make it a bit unique and get more people involved and to give one-to-one attention to everyone. 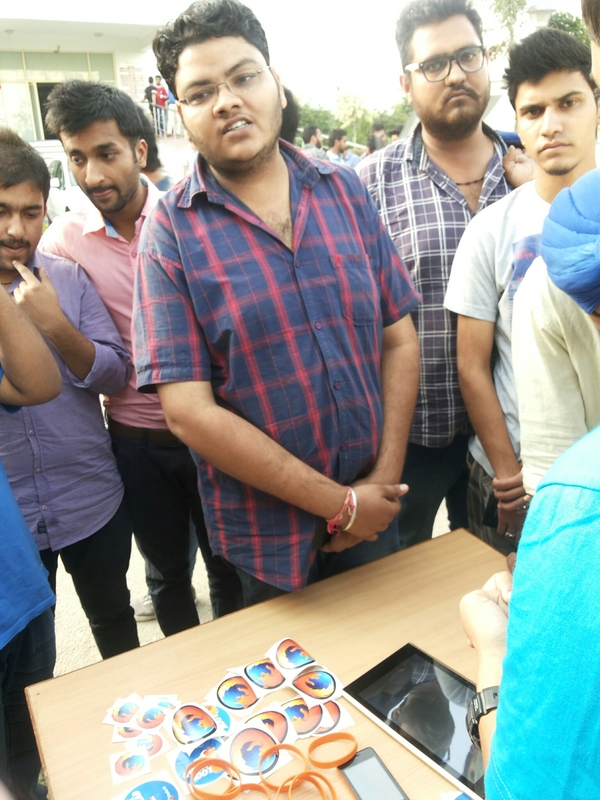 To our surprise, more than 450 students approached us, learned great new thongs, experienced and tested the Firefox OS devices and registered for the FSA program. Amazing and Creative people getting involved. We wanted to do something great and different. We approached 1000+ amazing people in a day. We got some awesome FSA’s onboard and got some really cool makes and Apps. We just happened to make this event great. Installing Android on your Geeksphone Peak. I have made this ROM for stubbornness, as a personal challenge, had no prior experience doing any ROMs for Android, hopefully not get anything out of this, just what I have already delivered an Android phone and many new skills. I share this with you so you can do your tests, performance comparisons with FirefoxOS, and yes, of course, to all those who you have the GP forgotten in a drawer for you to give at least a little more vidilla. Dont ask for nothing in return and I owe you anything, I do not demand anything, if something is surely fix it if I see that is important or interesting to me but I will because I want to and if it’s a challenge for me. I do not take responsibility for any damage that the installation of this ROM you may cause to your phone. I have nothing to do with Geeksphone nor FirefoxOS development. And last and most important. Do not install this ROM if your phone is not a Geeksphone Peak, do not work and will turn your phone into a brick may have to take the service to retrieve. Download the zip with the images here . Unzip the zip file to a folder on your hard drive. Ensure that your phone has enough battery, usually nothing will happen because everything is done with the phone connected by USB but if for some reason runs out of power while flashing images of your phone could become a brick. Go to your phone with Firefox OS without having it connected via USB, turn on remote debugging: Settings -> Device Information -> More -> Development and check the “Remote Debugging”. Or if you have it in English: Settings -> Device Information -> More Information -> Developer and check in “Remote Debugging”. (I have set memory may not exactly match the names). If you are using Windows you’ll need the USB drivers phone. You can download those here . And unzip to a folder. Connect your phone via USB to your computer, Windows will detect the device and search for the drivers, say they’re in the folder where you extracted the drivers in step 5. Wait and pray (just kidding ;-).) 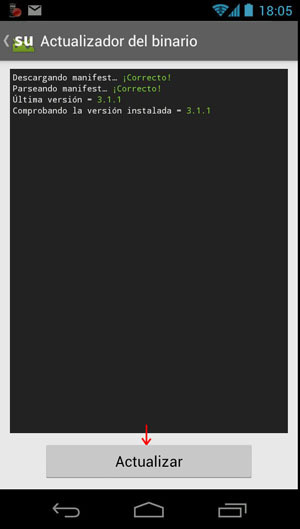 They will start sending the images to the device will restart and after a few seconds with black screen image loading “ANDROID” appears. Congratulations and have an Android ICS running on your Geeksphone 4.04 Peak. The rom is based on sources AOSP particularly those publishedcodeaurora (qualcomm) for its chipsets. (The Peak GP carries a qualcomm chipset). The Android version 4.04 is simply using the same wherein the FFOS is based and therefore have the Linux Kernel Peak GP for this release. You had to start at easy and secure maximum possible success. In the ROM are included Google applications and up to date until the date of this publication. 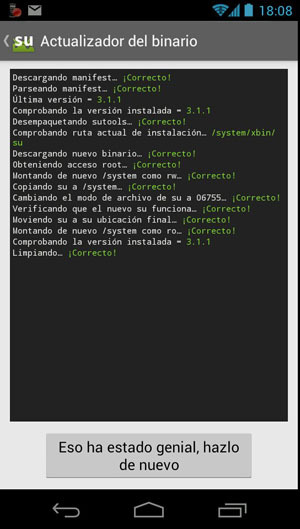 The ROM is pre-rooteada, this means that it is ready to be rooteada in a few clicks so you can use any application that requires root permissions. To finish the rooteo you must follow the instructions in the next section. The ROM has also included the “Titanium Backup” application to make backups of applications and system information. 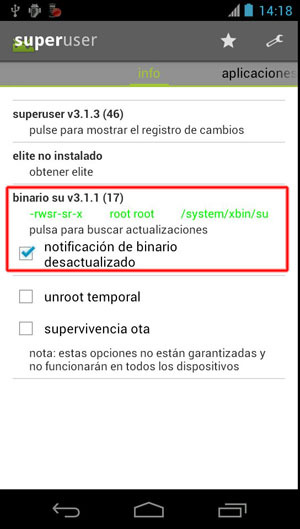 This application requires root permissions so to use it must first be rooting the ROM. 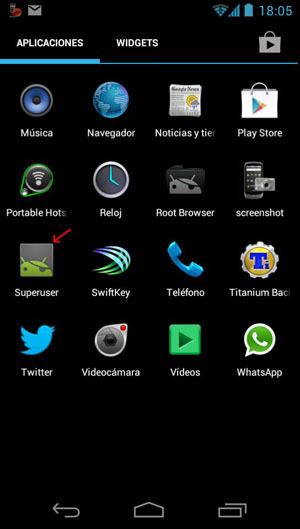 Both this application and the “Superuser” can be uninstalled without problems and installed again from the “Play Store” or other similar install. As far as I’ve tried it took several days with her, everything works perfectly. 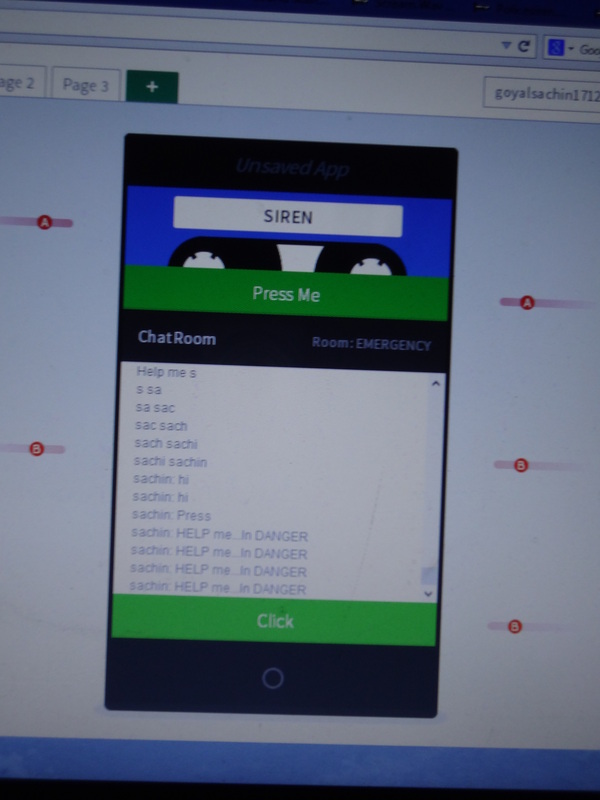 Call, SMS, 3G, Wifi, Bluetooth, camera, sensors, accelerometer, GPS, etc..
To finish the rooteo ROM you need to have phone with data connection, either wifi or 3G, GPRS, etc.. and follow the steps. 2) Slide the display to show the “info” and click on the subsection where it says “your binary v3.1.1 (17)” in the area where the letters are on green. 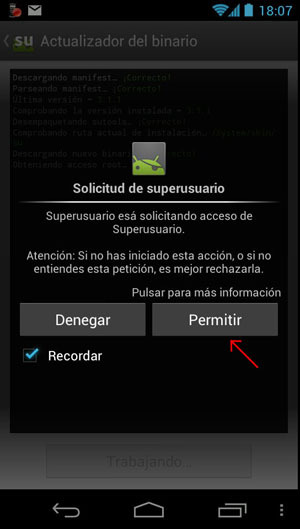 4) own “Superuser” app will ask permission “root” we owe grant. 6) Now you can exit the application. You already have the phone rooteado! You’ve flashed your GP Peak with Android does not mean that you can no longer return to FFOS even be changing from one to another. At any time you can regain FFOS installing the official ROM Geeksphone of here . This will leave the phone exactly as it was before the backup. I mean, you can make a backup of your android, flash the ROM with FFOS when you tire again, flash the ROM with Android and do the restore and have Android phone exactly as before. Change the ClockworkMod recovery. Although having rooteada ROM with fastboot and adb and you can do everything. Ask FFOS and dual boot Android. I think it could be possible and not too complicated. NOTE: To get back to Firefox OS, maybe try 1.1 or the nightly versions, visit http://downloads.geeksphone.com/ and download the version of your need. 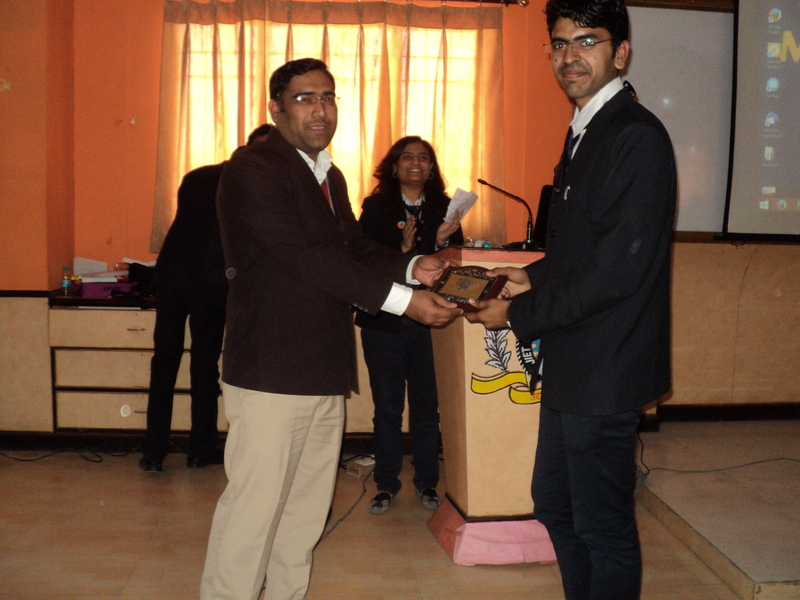 It started sharp at 10:00AM, all speakers were welcomed and workshop was initiated by Mr. Osho Parth. 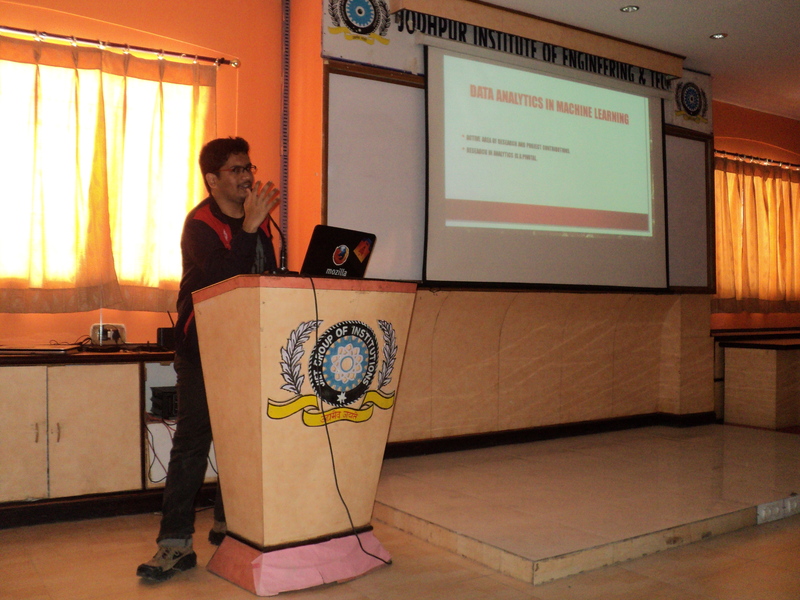 He told students about Open Source, FOSS, how they can get code of any open source softwares and can work on it, he also told them how mozilla is part of open source and what students can do for mozilla. Next session was taken by Mr. 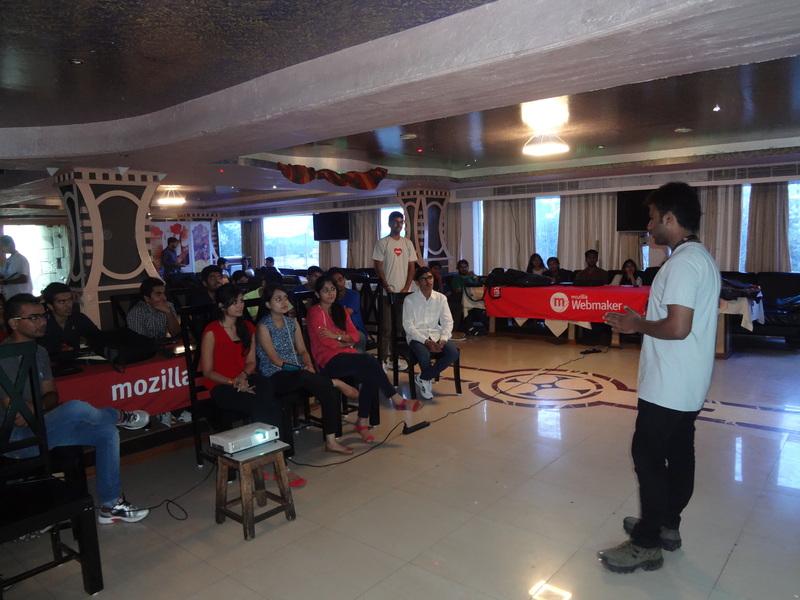 Lavish Aggarwal , introducing Mozilla, its mission and other products of Mozilla which were new to students as they were only aware about Firefox Browser continuing with this they were also told them about Open Web and philosophies of Open Web. 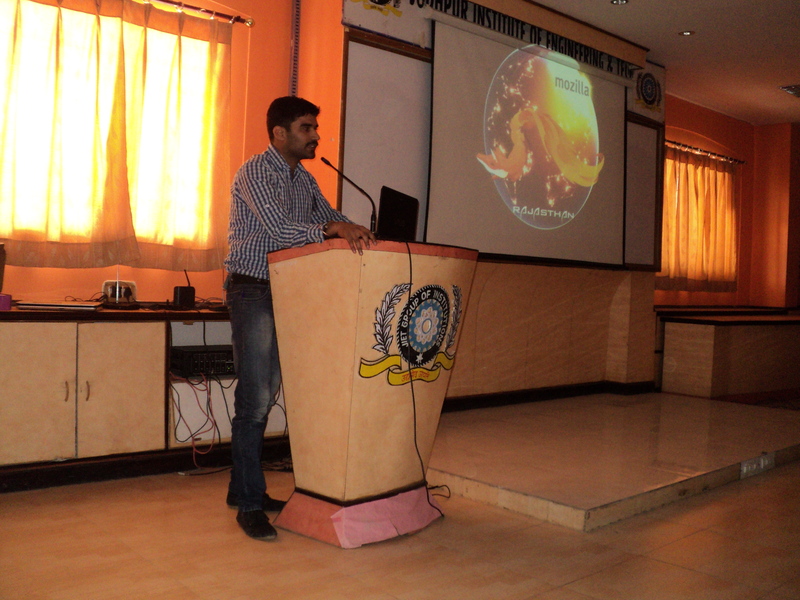 Putting the next step forward, next session was taken up by Mr. Varun Kaushik (Me). 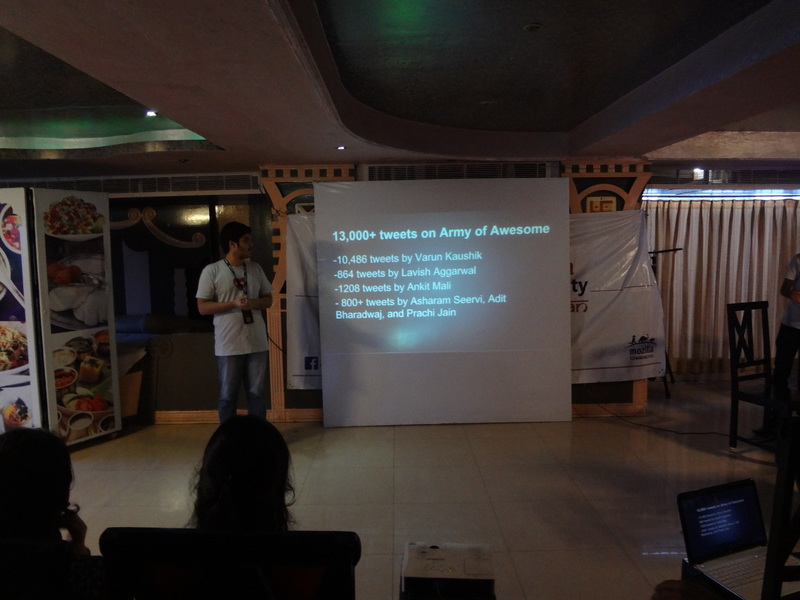 He told students about SUMO covering AOA, ln10, QA, Support Forums and writing an article. 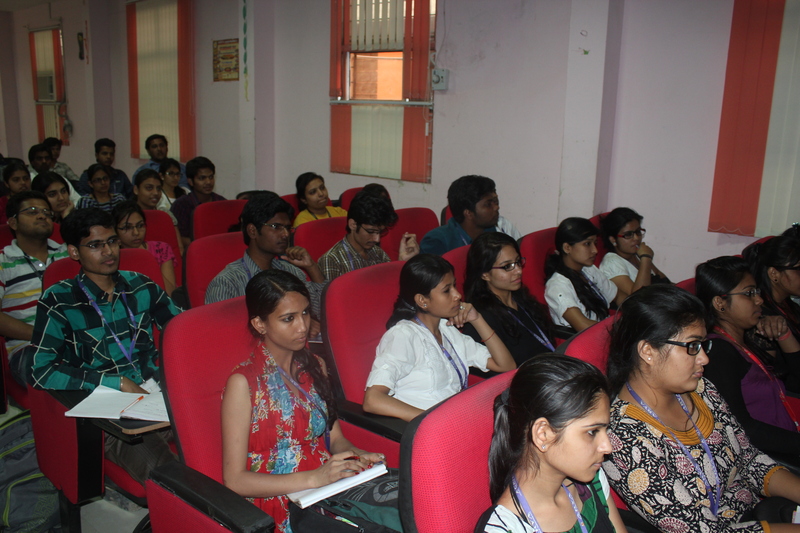 Students were keen to know about such convenient way of contributions. 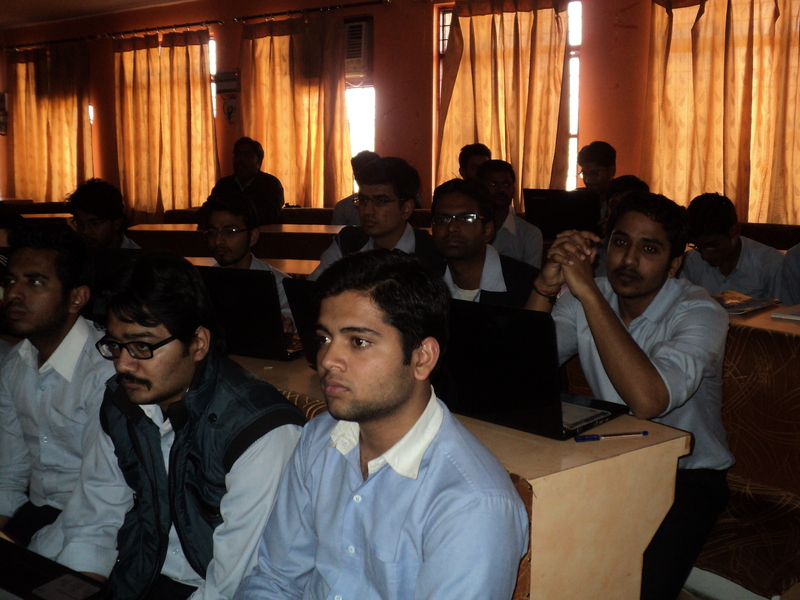 Keeping the continuity of workshop, me and Osho introduced students about one of the sexiest tool of mozilla i.e; Mozilla Webmaker. 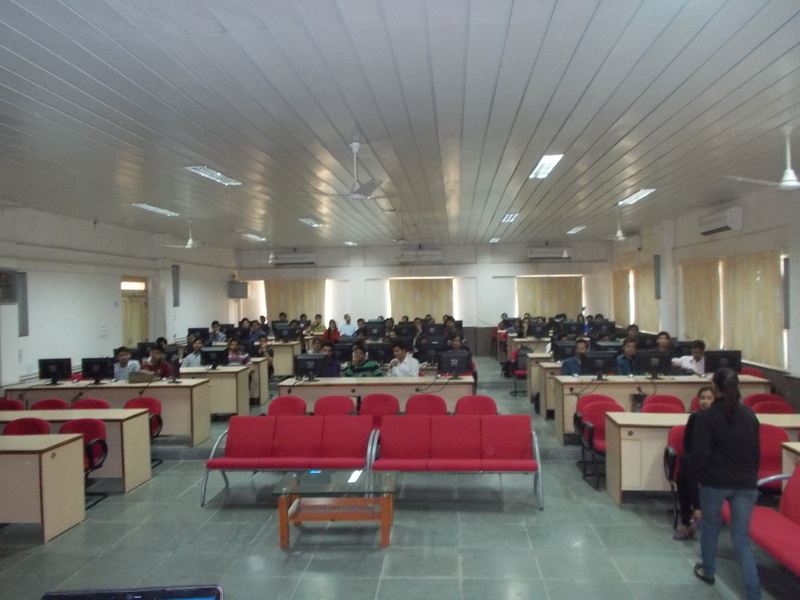 Students were amazed by seeing online editing of websites using X-Ray Goggle, live rendering of html pages using thimble and video mixing tool i.e; Popcorn. 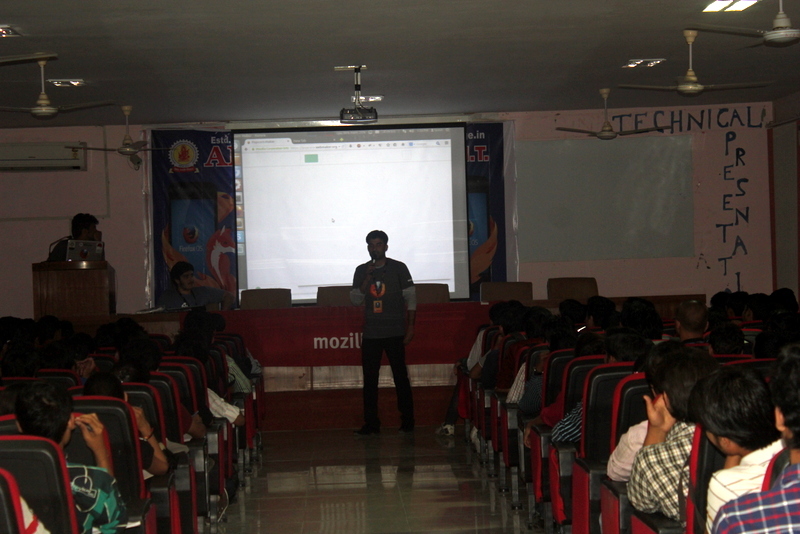 Next session was taken by Mr. Osho, in which he introduced students about Firefox OS, its different layers and why it is useful and many advantages of OS. 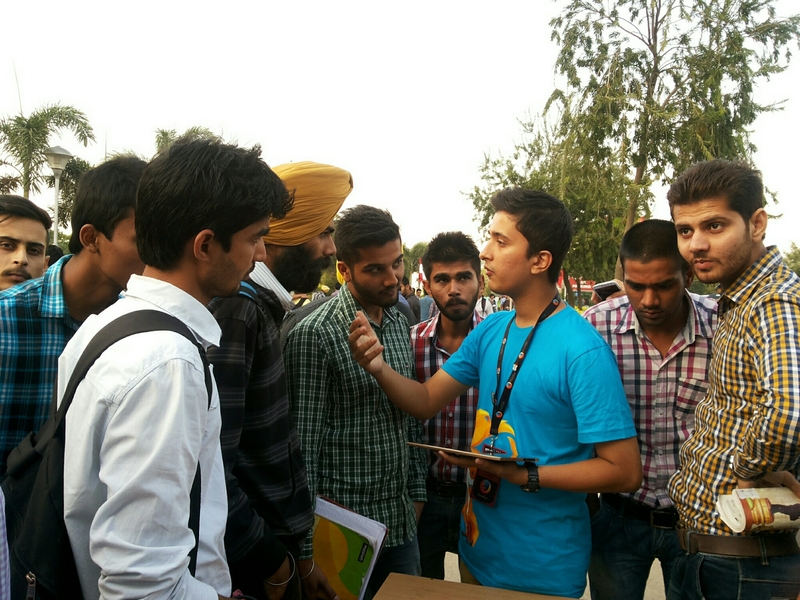 Students were eager to see this new OS in their hands. 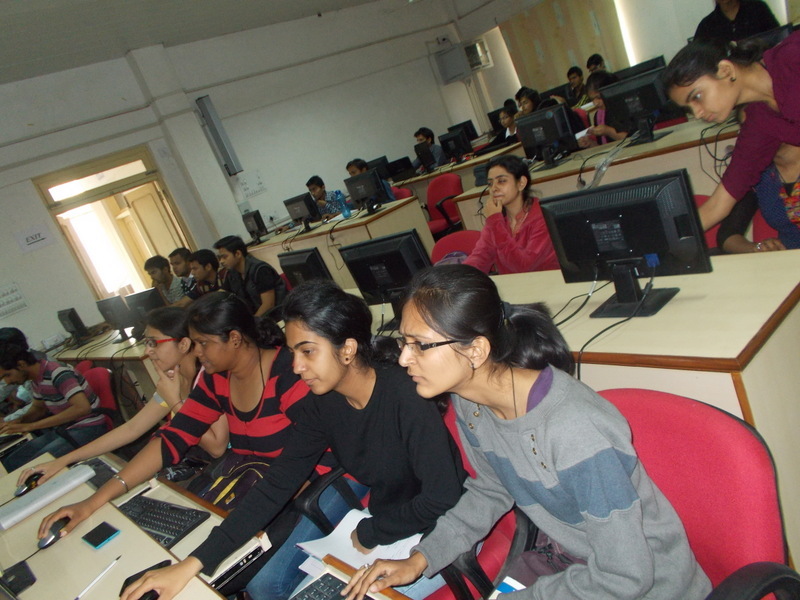 Students were amazed to see that how easy it is to build app in Firefox OS by simple HTML5. 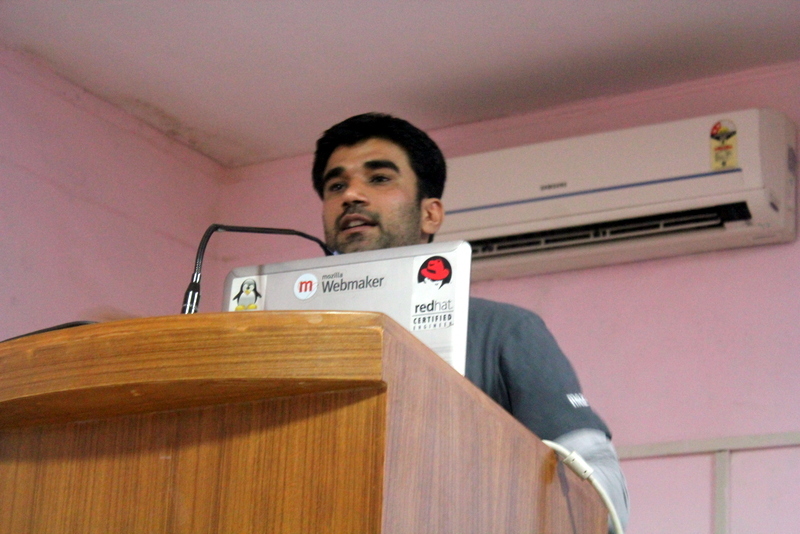 Bringing the workshop to the end an interesting session about cracking was taken by Mr. Osho, where he told students about system hacking, grub hacking and many more cool stuffs. 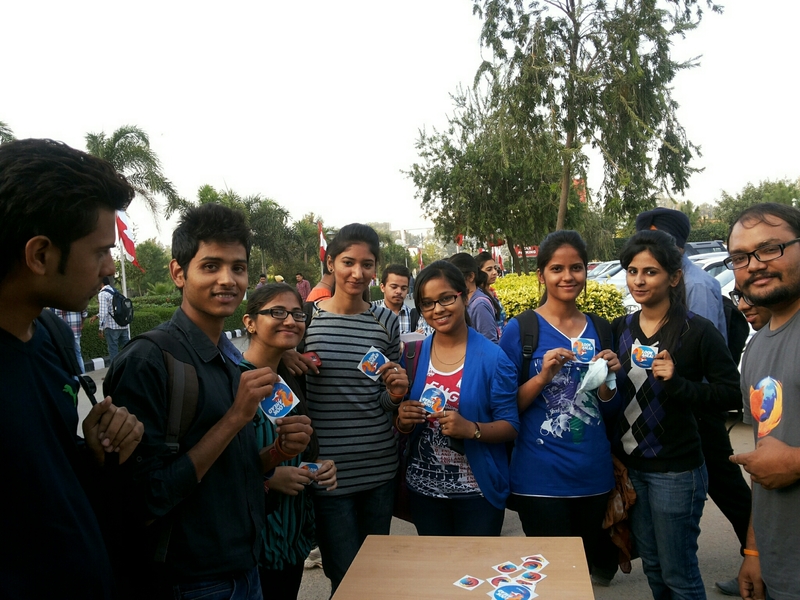 SWAGS were also distributed to all active participants. 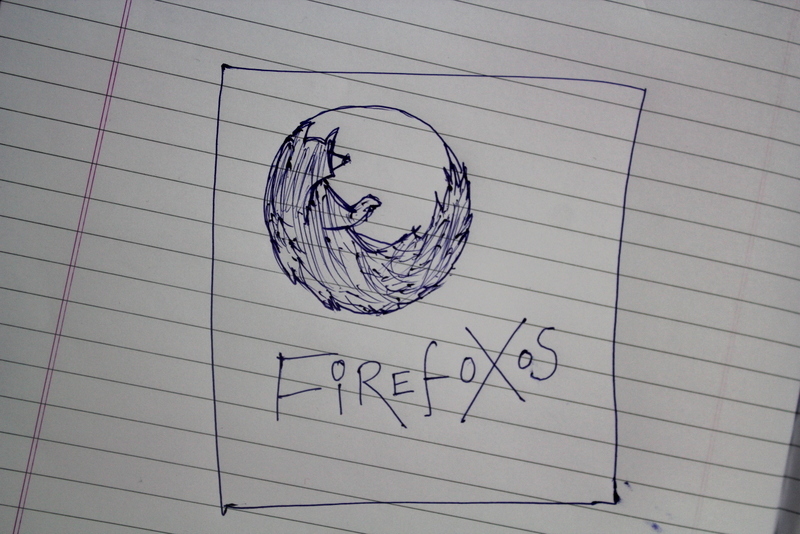 Sketch of Firefox by one of the open source enthusiast during the workshop. 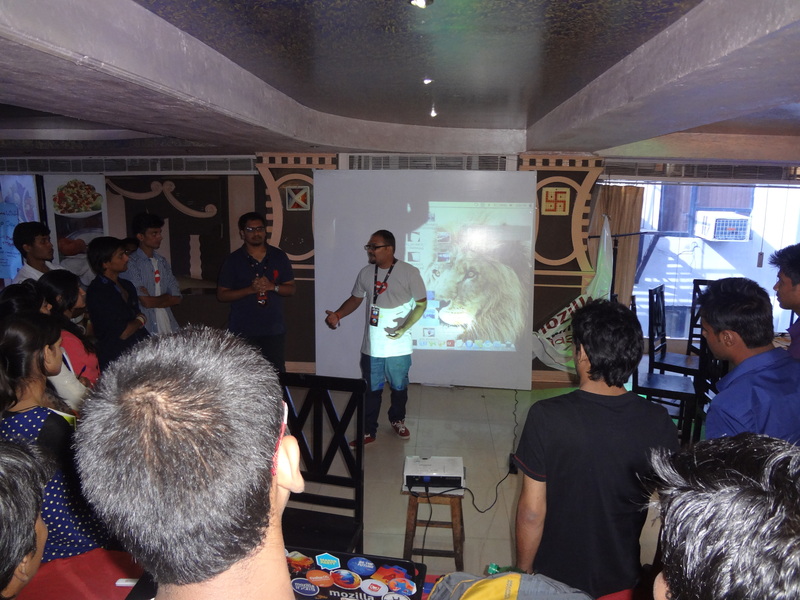 So, again Mozilla Community Rajasthan organized an event of great success in Udaipur – City of Lakes :). 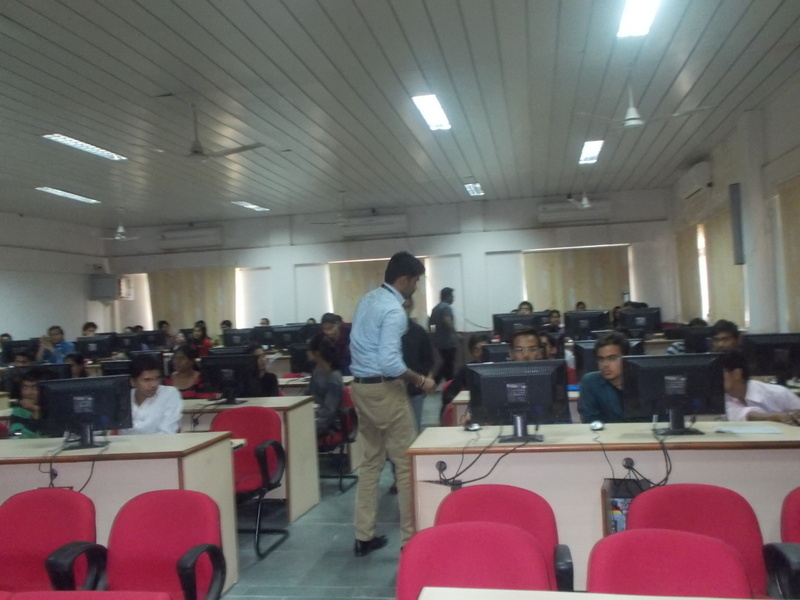 The Event started at 02:00PM in Computer Science department of CTAE college. 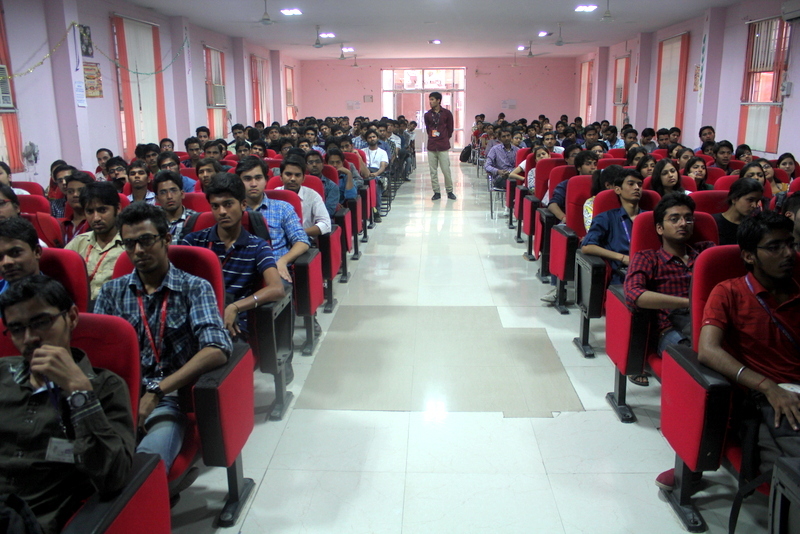 On the spot registration of this event was done and more than 100 students actively participated in this event. The session was started by Miss Charul by introducing all speakers. 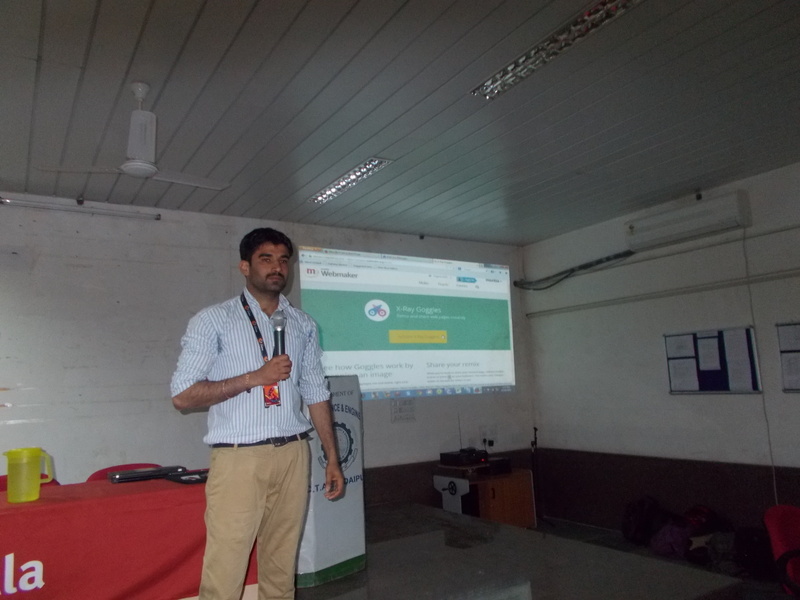 The first session was taken by Mr. Osho Parth. 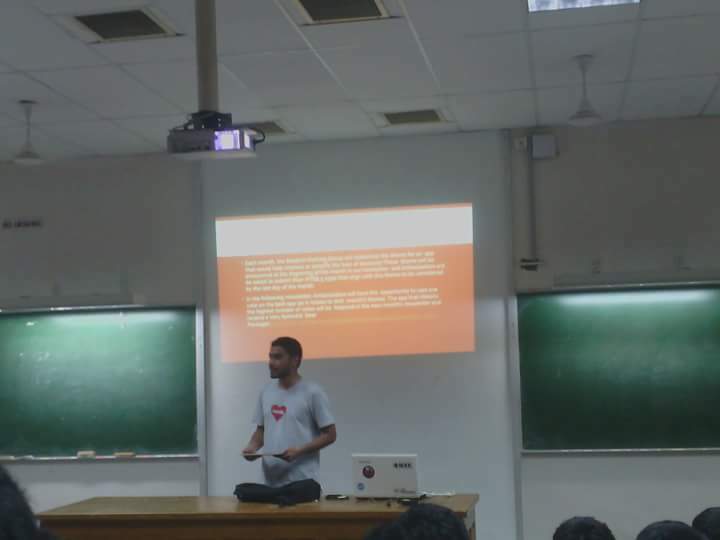 He gave a brief introduction about FOSS and open source, discussed differences between semi open source and open source, Firefox OS and also told the power of open source and mozilla as part of it. 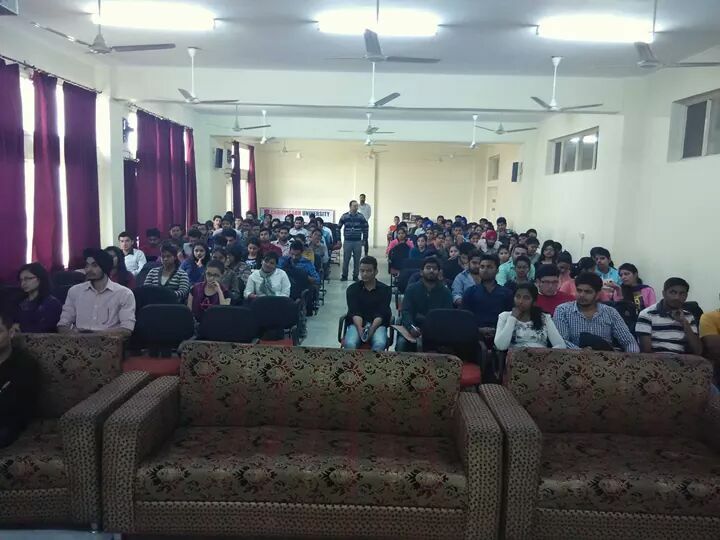 Many students were keen to know a more about open source, they were really impressed by seeing power of open source, they were keen to know about mozilla. 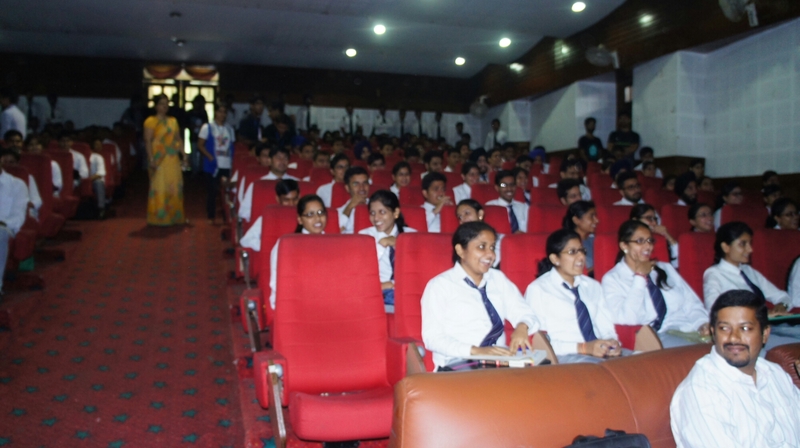 Students showed a great interest. 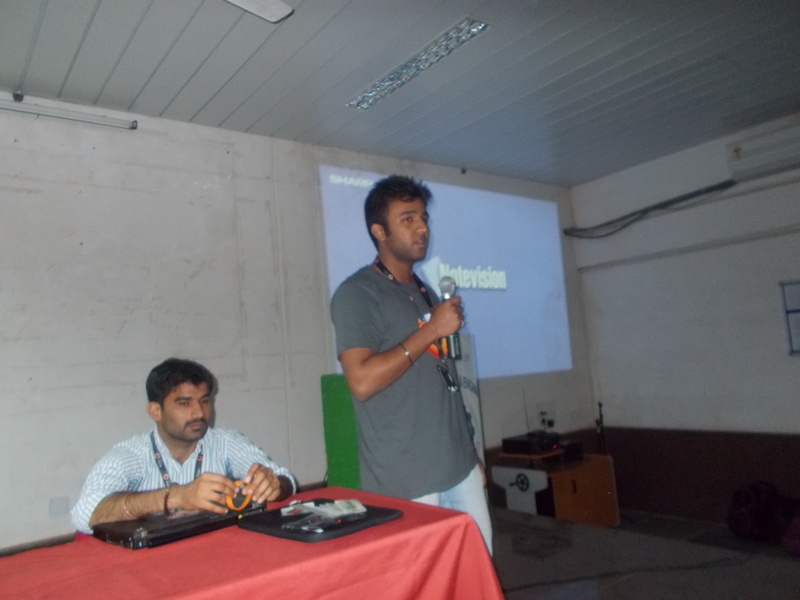 He also discussed about different layers of Firefox OS and working of each layers. 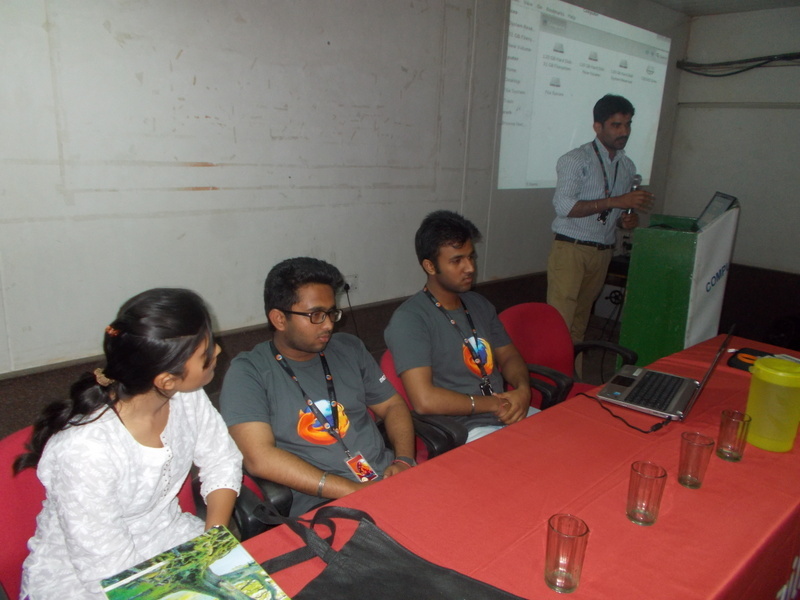 After that Diepesh Monga, discussed about mozilla and its mission. 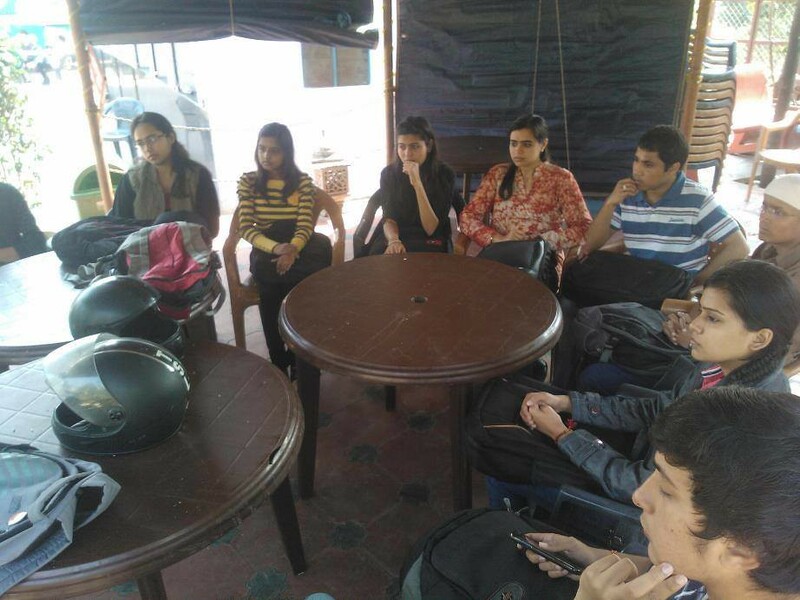 He told them about some products and tools of mozilla like Thunderbird, Persona, Open Badge, Web Maker, Mozilla Lab, Fire Bug, etc. 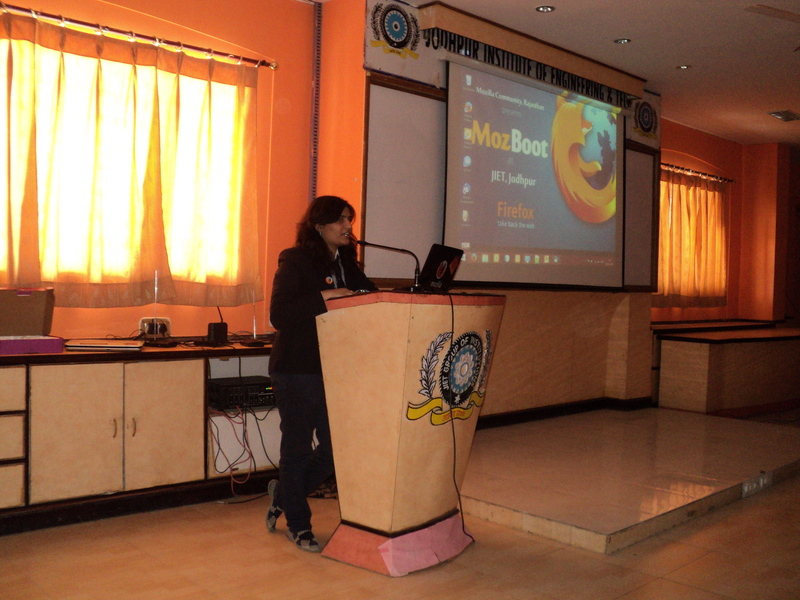 Next Session of Application Development and How to customize GUI of Firefox OS in the way you want was taken by Lavish Aggarwal. 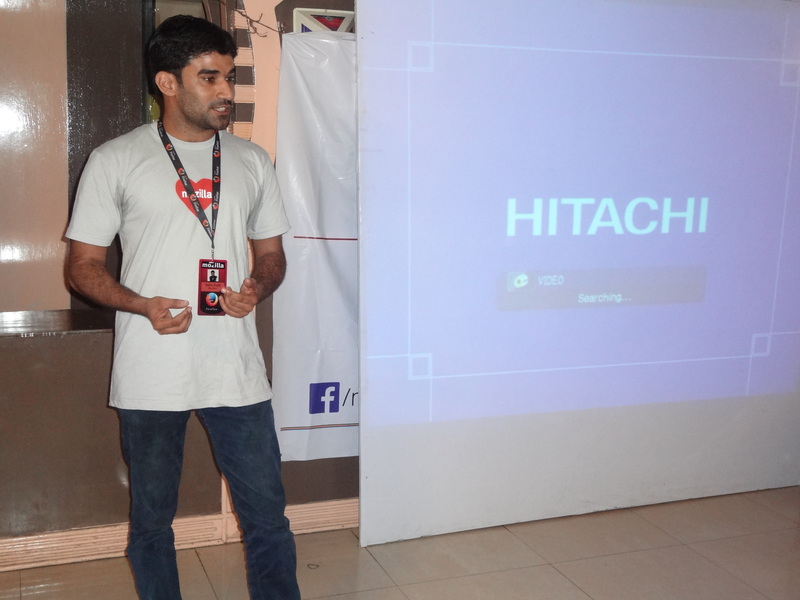 He taught them how to develop app and submit it into market place by simply three steps i.e. Design, Build, and publish. 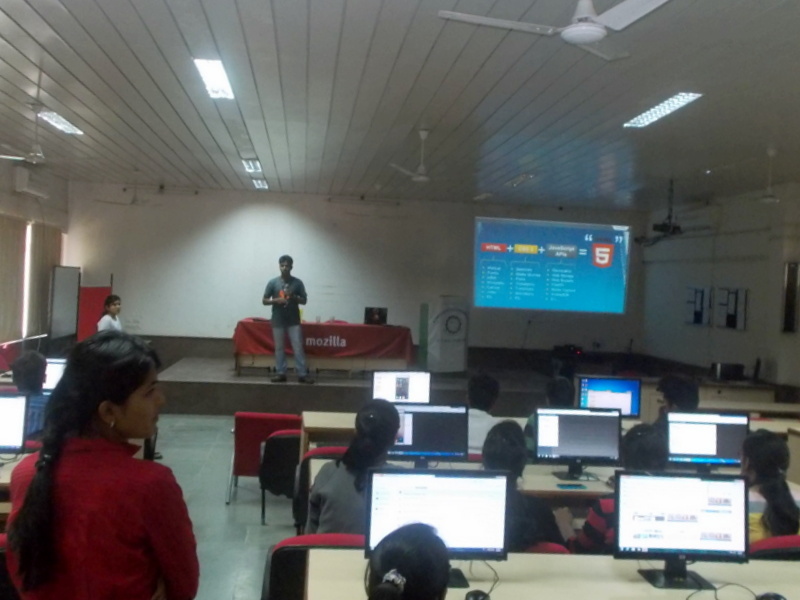 He also told them about HTML5 and importance of HTML5, CSS3 and JS. 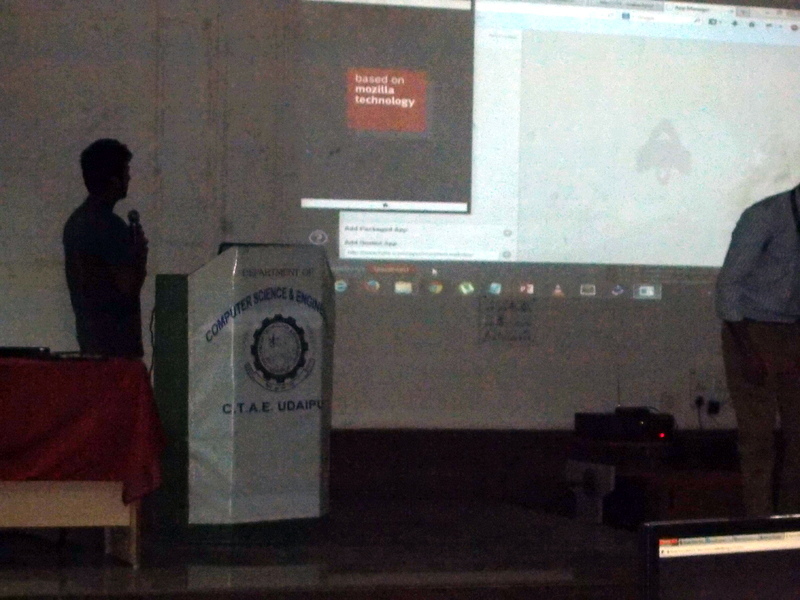 Live demo of Hello world app was shown to students by using Firefox OS simulator.He also told them about manifest file and its importance for submitting app into market place. 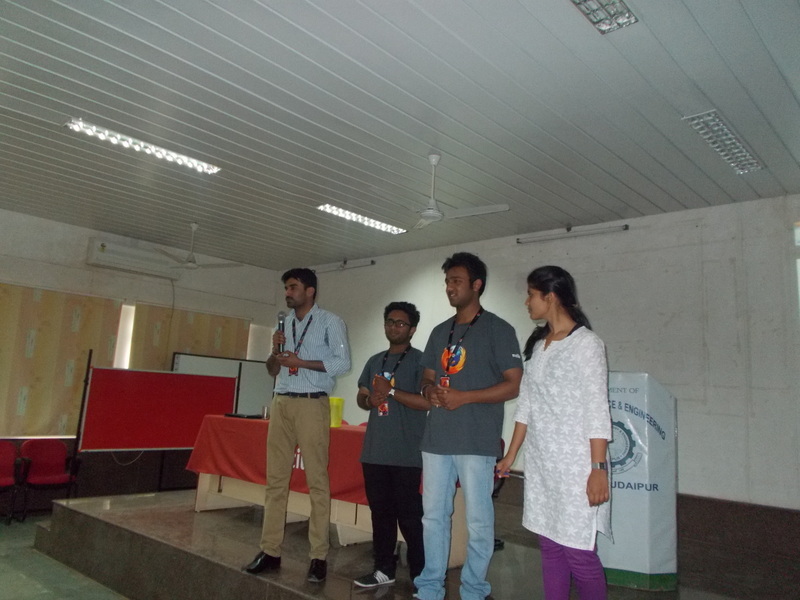 Each Student was developedhis/her own hello world app for Firefox OS and volunteers helped them out. 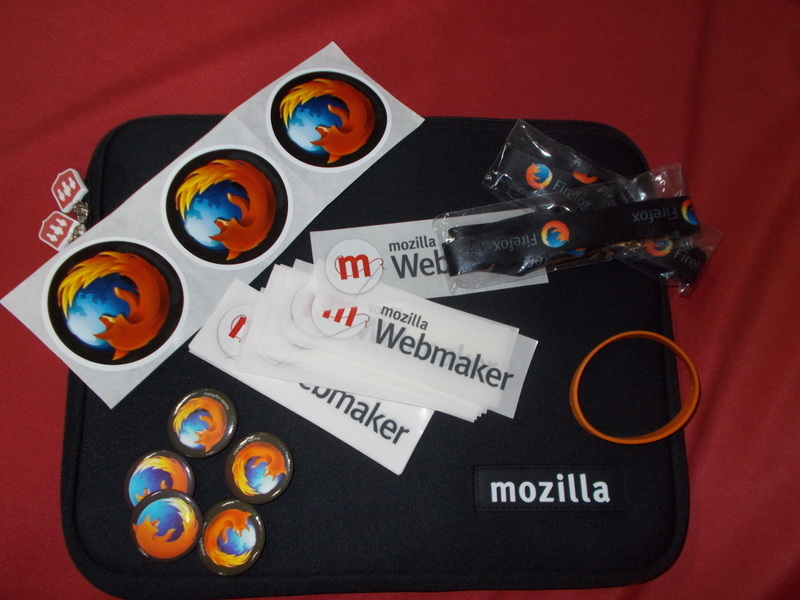 Now, time for introducing awesome webmaker tools of mozilla, this session was taken by Osho and me. A live demo of each tool was shown to students, students were really amazed by seeing X-Ray Goggles, they used this tool and remix there favorite website in the way they want. Students made real good pages using Thimble tool and also remixed some youtube videos using Popcorn. 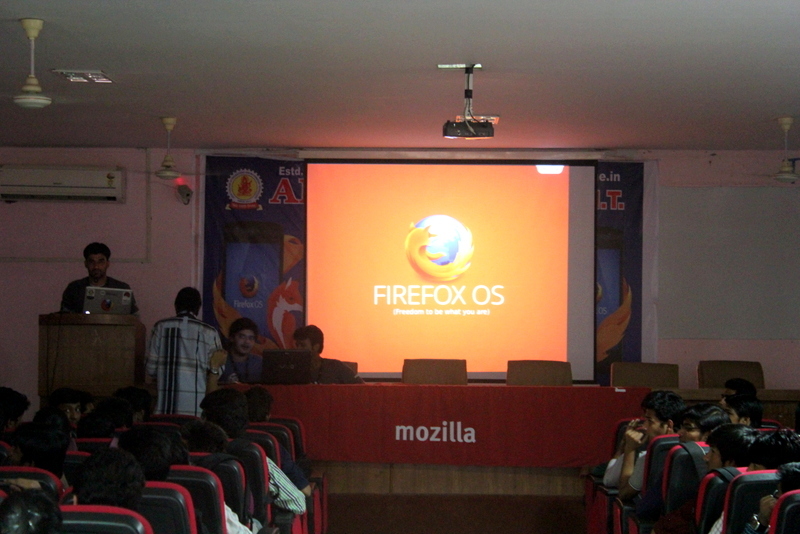 Then I told them about debugging of Firefox OS, and how to change UI in any way by using web technologies. 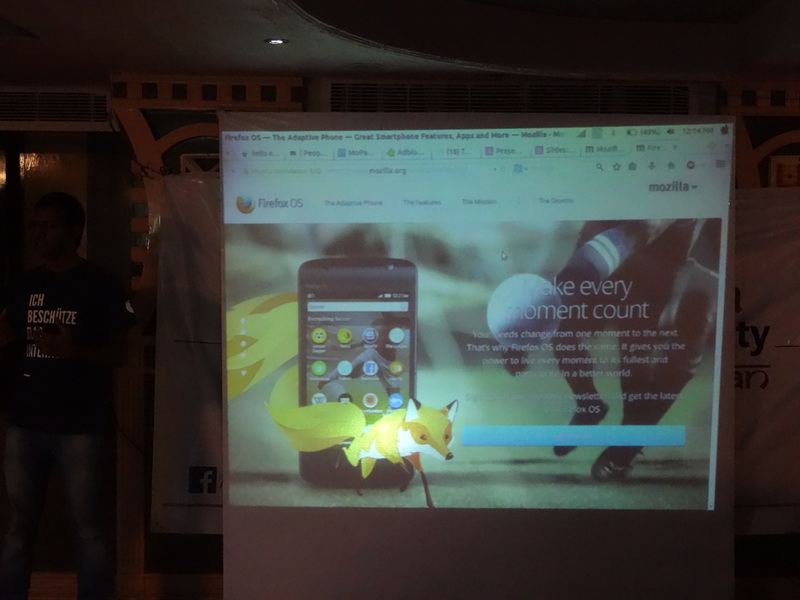 They were eager to use Firefox OS and wanted to change it in the way they want. 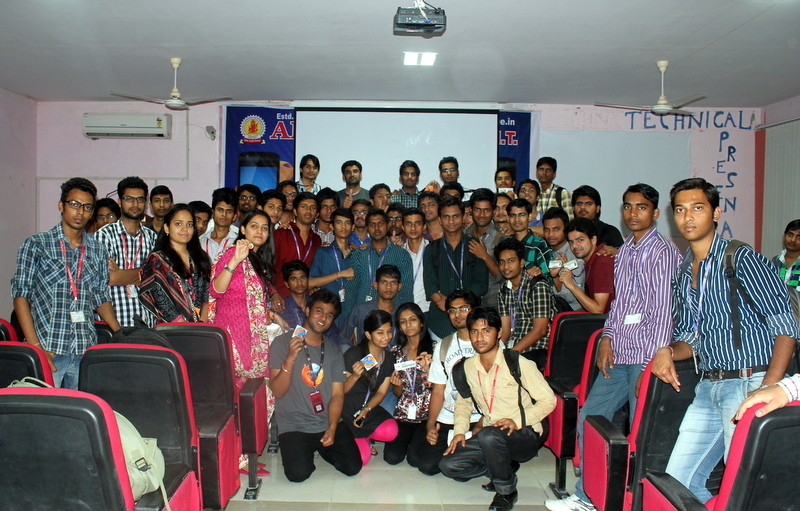 At last a group pic with all volunteers who helped in making this event into great success. 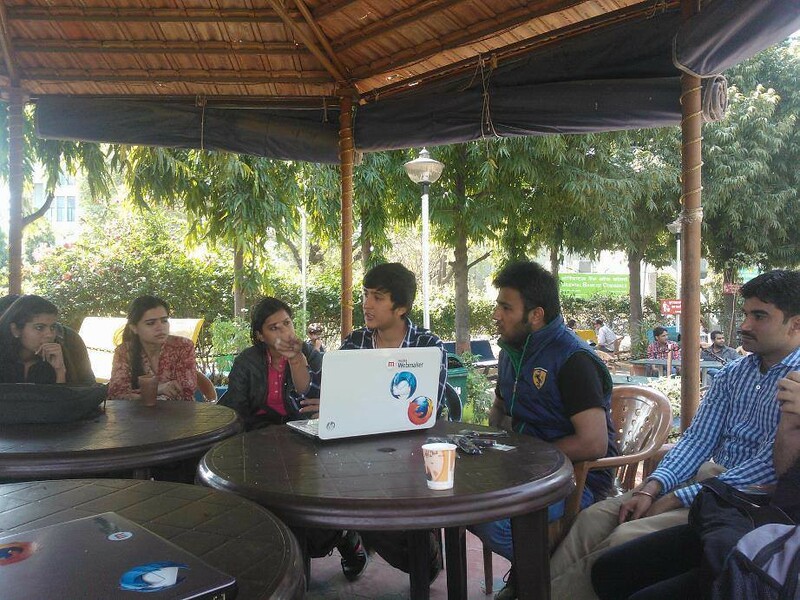 So, this was another Meetup of the Mozilla Community Rajasthan which actually proved to be a great success. 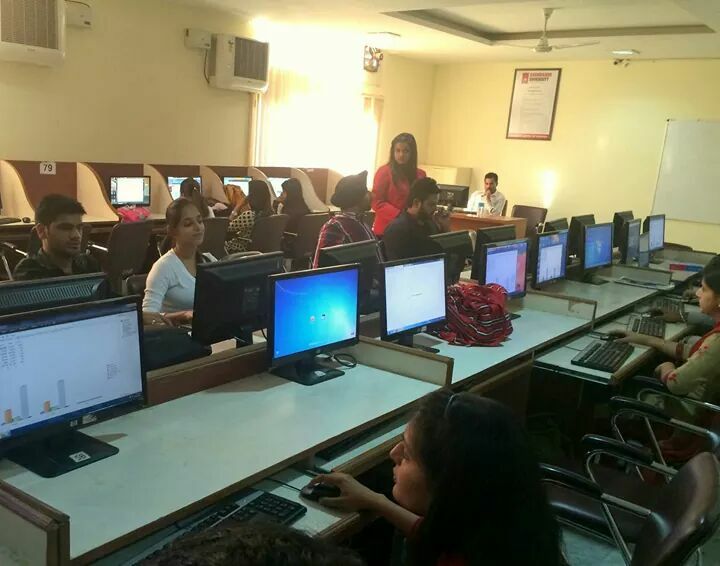 The best part was, Many girls actively took part in it and had a keen interest to about Mozilla Project and How to Get involved. 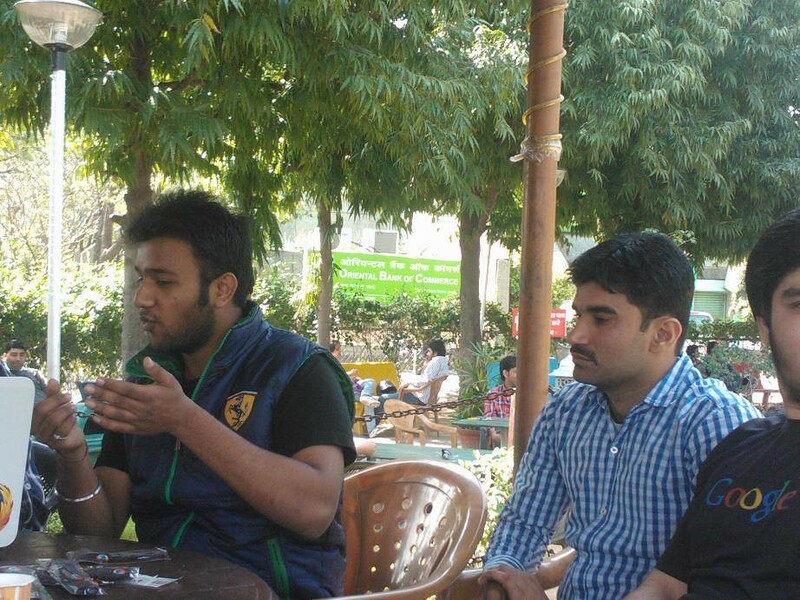 The Meetup started sharp at 11:00 A.M. at Saras Parlour’ Jaipur. 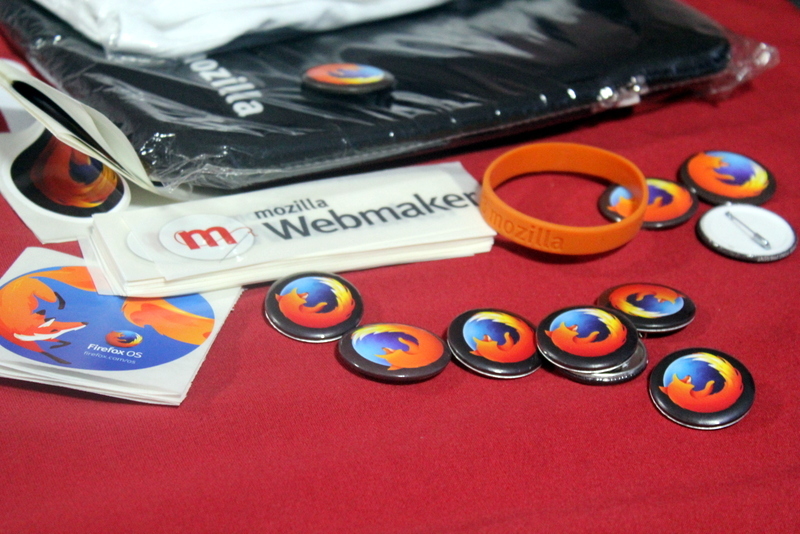 and 12 newcomers who were interested in being a part of Mozilla. 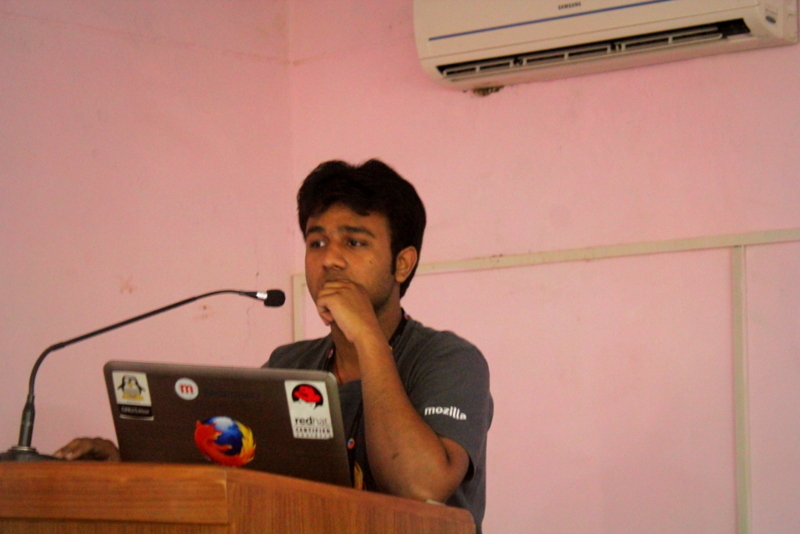 The session was started by Osho Parth who talked about FOSS, Mozilla and Firefox OS. 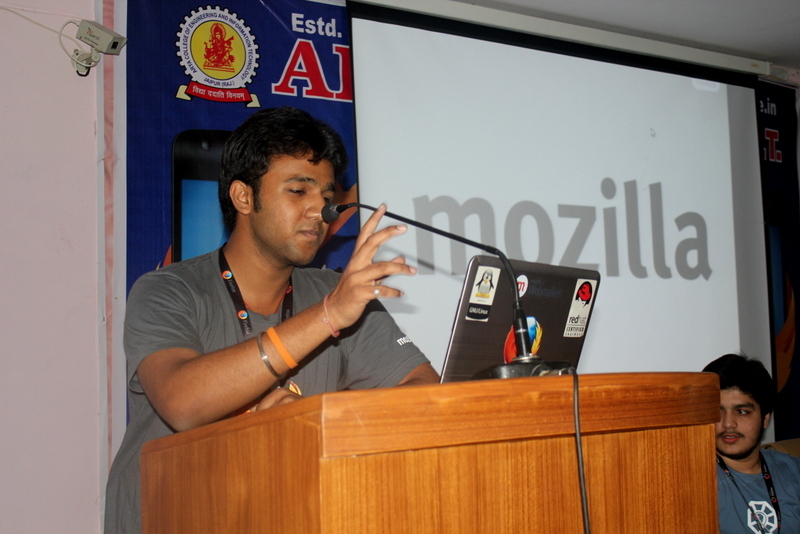 He gave an informative talk about Firefox OS and explained it to everyone to the core. 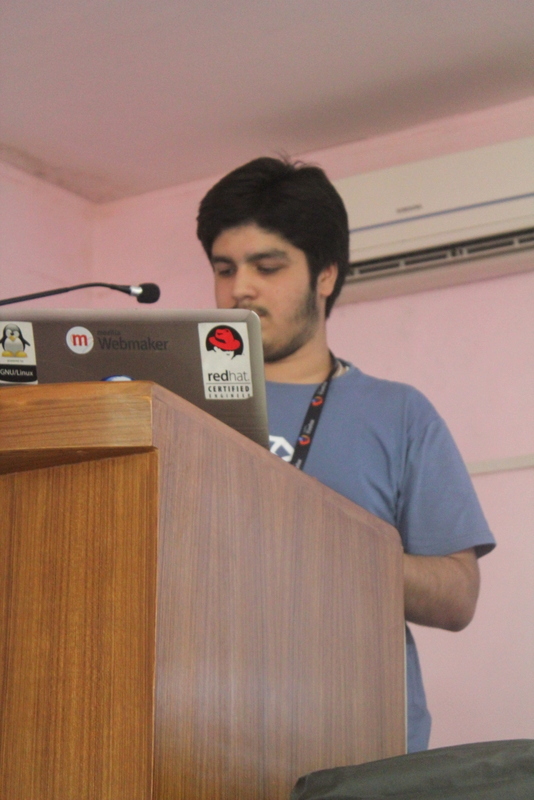 After that Trishul Goel an amazing developer discussed about the Benefits of using Open Source and gave an informative session on How to Create Firefox OS Apps. After that i discussed the areas of contribution recommended for beginner Volunteers and How can one chose their type of areas according to their skills and areas of interest. 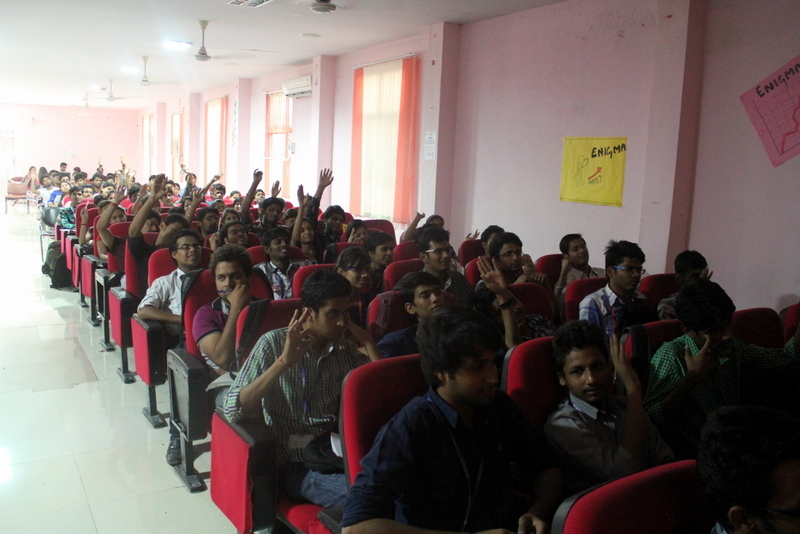 After that Lavish Agarwal and Adit Bharadwaj gave an informative session about Webmaker. They also gave some live demos on how to use Popcorn, Thimble and X-Ray Goggles. 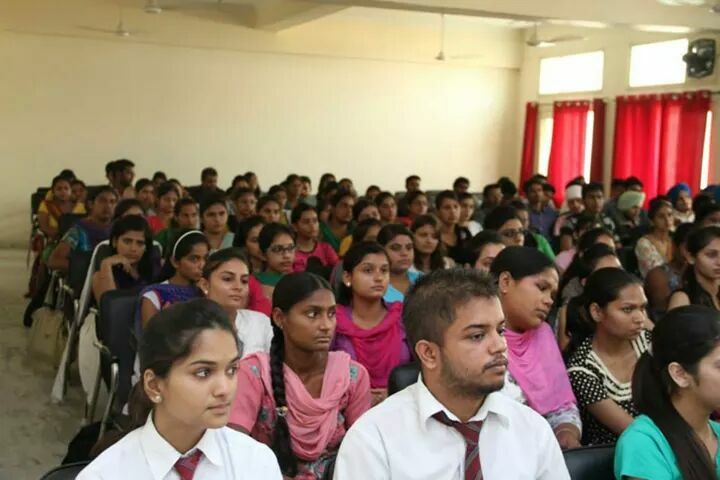 After that Lavish Agarwal went for a recruitment session and registered for 7 FSA’s and the best part was all of them were girls. 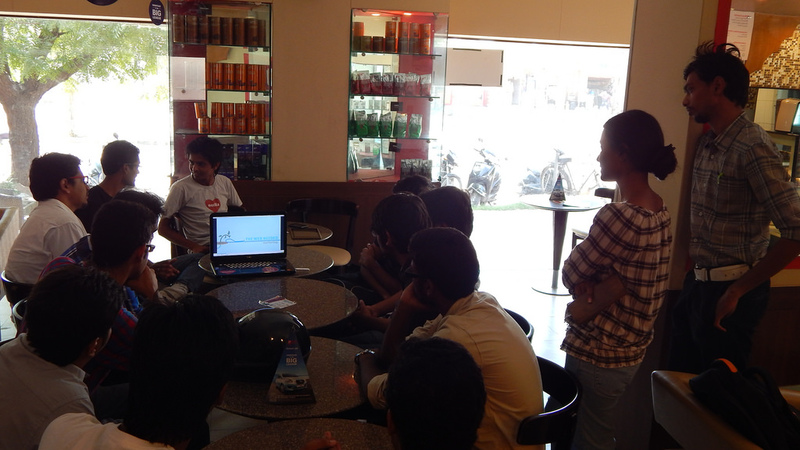 It’s good to see so many WoMoz ‘es from Mozilla Community Rajasthan. 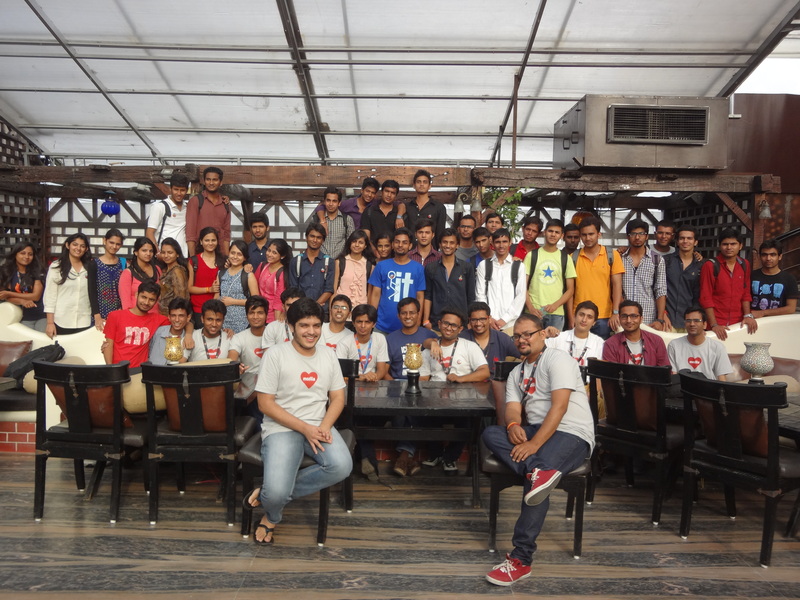 So this fun learning meetup came to an end, and how can one forget a Group Picture of the newly updated MCR Team. 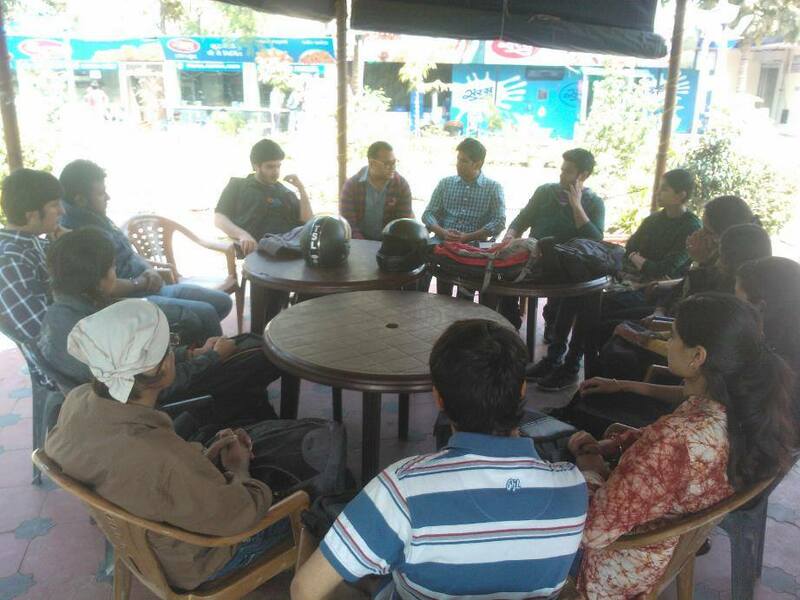 All pictures of the Meetup can be found here. 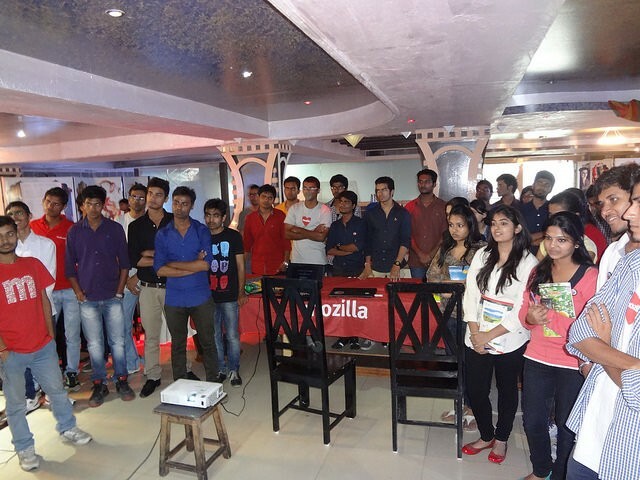 Mozilla Community Rajasthan is growing, and has crossed many milestones but these milestones are not enough for MCR, because MCR Members and Mozilla Lovers of Rajasthan are increasing day by day. 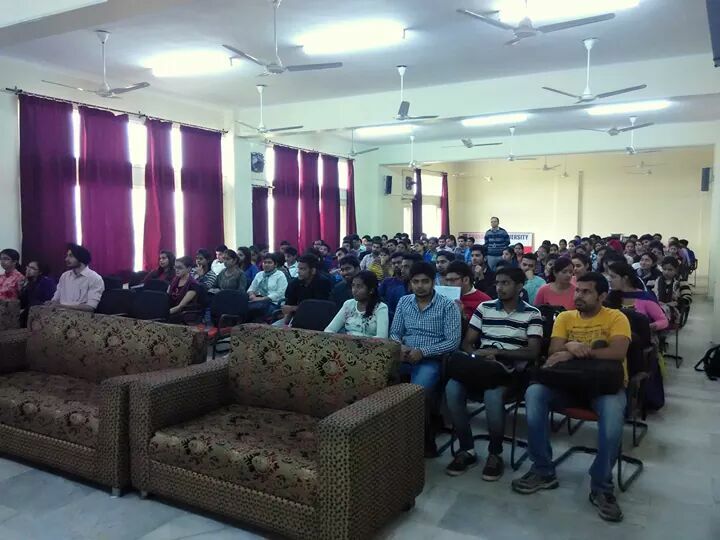 So we conducted one more awesome event at JIET Jodhpur. 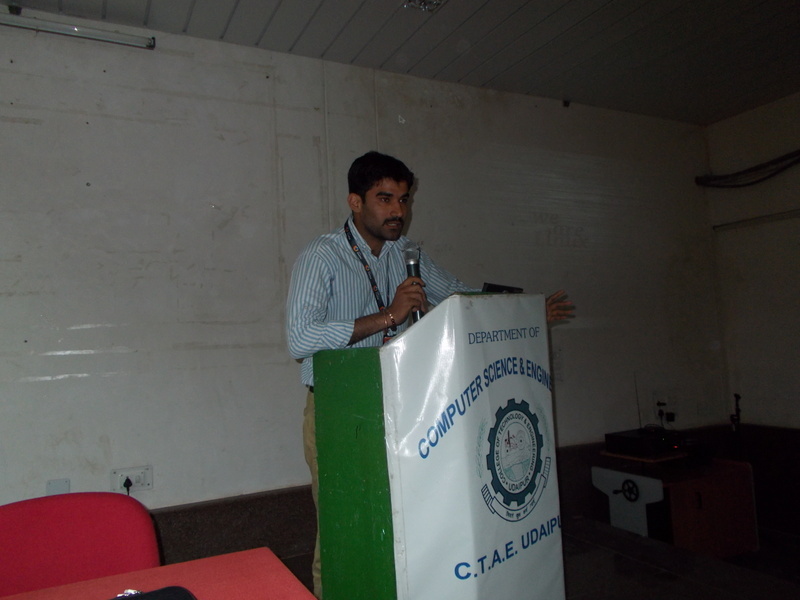 So, Event started by Dean of JIET – Setg college with motivation speech and informing agenda of this workshop to students. 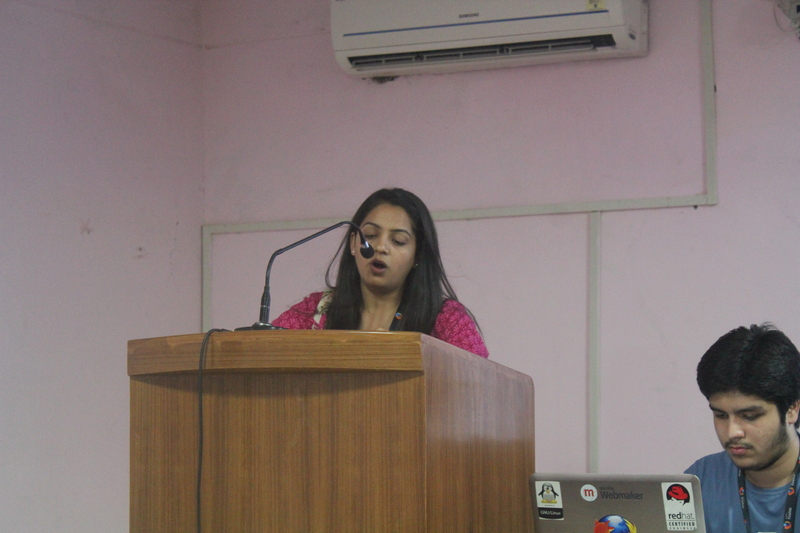 After that our host Khayati Kapoor Welcomed all participants and speakers. 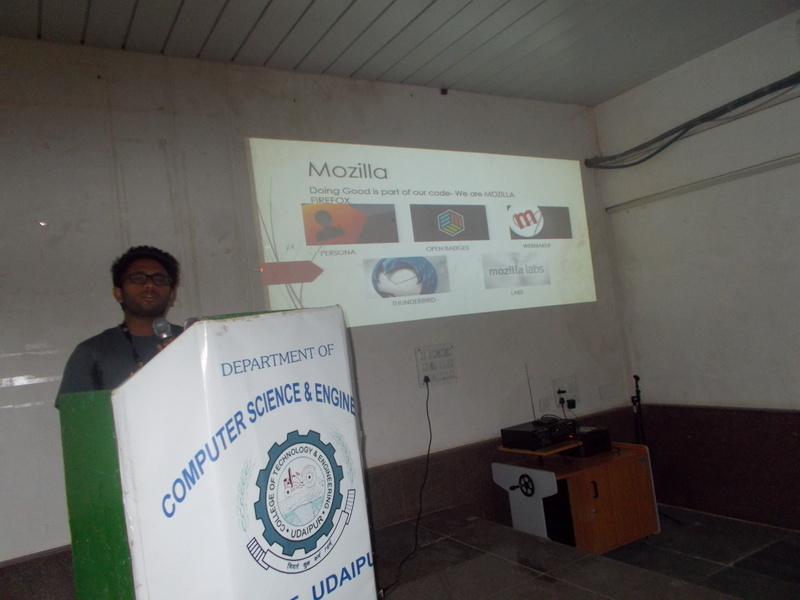 Workshop had been started with Open Source Overview and Mozilla Community, by Meghraj Suthar. 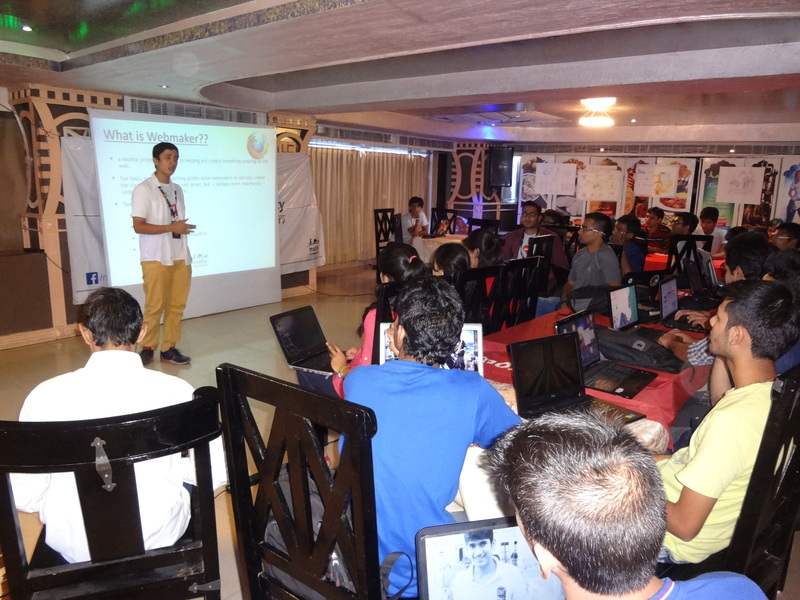 Participants were very keen to know about the “What exactly is FOSS?” and what are the communities in which they can get involved. 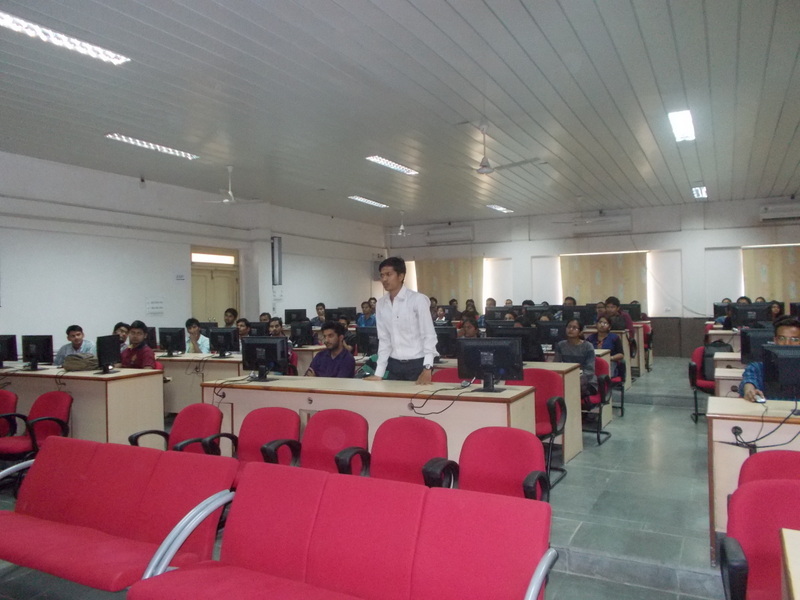 After this session Raj Rohit introduced Data Science and Live projects of Open Source. 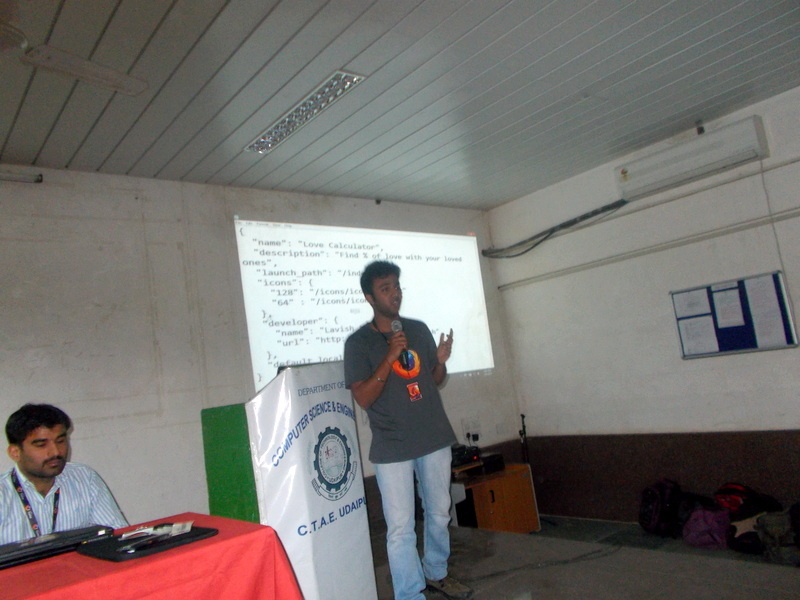 After this session Osho Parth introduced about Firefox OS and benefits of Open Source. 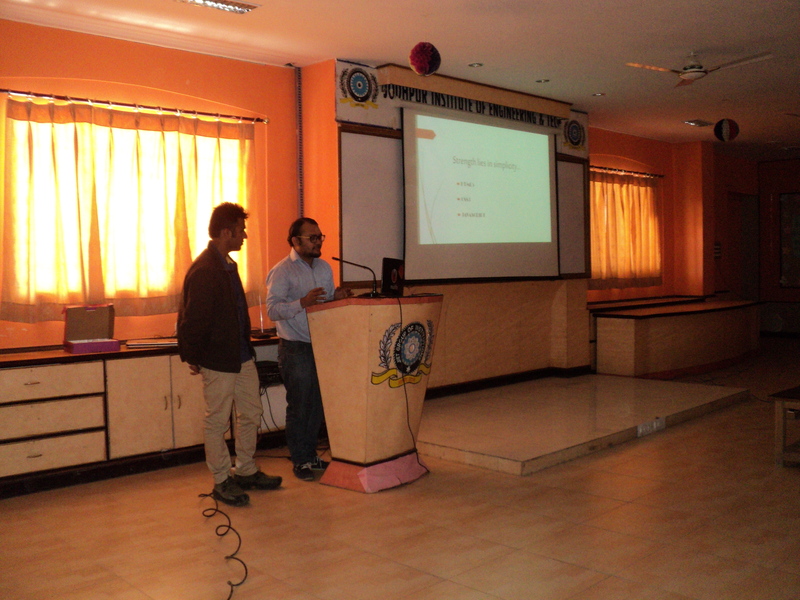 After that great session Trishul and Lavish discussed about “How to make application in Firefox OS?” and also about HTML5 and CSS3 platforms. That’s an end to an awesome event. 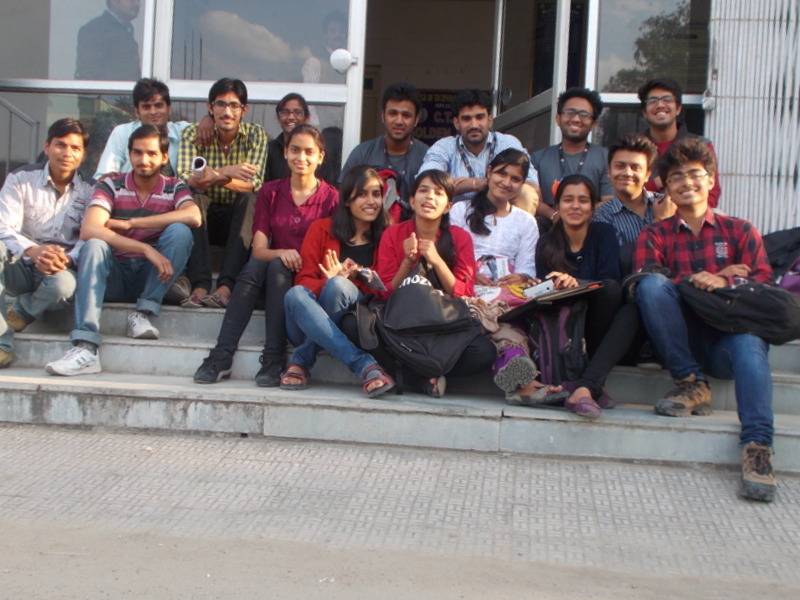 Last but not least, we had a group photo on the stage of the JIET.